You can imagine in the 25-years David Richards has been a private pilot, he has had quite a few bird-eye-view encounters. So, he knew the increasingly dark cloud of smoke he spotted Saturday morning in Woodburn was worth a detour. "We were coming home past the Woodburn Factory Outlets and I saw a smudge of smoke ahead and I said -- what's that? Let's go look at it," Richards told KATU News. Richards, alongside his neighbor, circled around with their phone recording and watched as the plume grew. Cell phone video Richards posted on Facebook shows the smoke getting thicker and the fire growing stronger as it engulfs an RV approximately 1500 ft. below on Pacific Highway in Woodburn. "You're a long ways away from it but what's very interesting is you can see the progression of fire pretty quickly and it went from a very small smudge to something very major in probably less than two to three minutes," Richards continued. Richards, a high school shop teacher, says he is now sharing his story and his video, in hopes of inspiring future small plane pilots. "We evangelize our sport because if more people could see what we see from the air, I think we would have more people interested in flying around in little airplanes," he said. Standing in his hanger, surrounded by planes he built himself, Richards says he hopes to pass along his passion of planes -- not just piloting but of the unique perspective that comes with being able to look down at something that can incite panic on the ground and awe in the air. The Smithsonian Channel has now aired its new program “Alaska Aircrash Investigations,” spotlighting the work of the National Transportation Safety Board. After negative pre-broadcast controversy stemming from U.S. Sen. Lisa Murkowski and the Alaska Tourism Industry Association, viewers can now to come to their own conclusions about the documentary program’s relevance and sensitivity to its subject. The episodes cover accidents that occurred in 2015, including both air taxi, commuter and general aviation operations. The camera crews were embedded with the NTSB as much as possible to take viewers through the initial investigation process. A narrator provides valuable context, graphics illustrate technical discoveries, the investigators explain what they are doing and, when permitted, interviews were conducted with family and friends of deceased pilots. The NTSB has four regional offices, but Alaska is the only state with its own office, staffed by five investigators. According to the agency’s databases, the Last Frontier averaged 99 accidents annually since 2005, including the particularly devastating years of 2013, when 35 people were killed, and 2015, when 21 people lost their lives. In both those years there were high-profile crashes involving air taxis and commuters that gained national attention. For Executive Producer Isaac Holub of Lucky 8 Productions, it was not the statistics that made the state the best setting for the program. "Actually, we chose to create a show around the NTSB, not around accidents in Alaska," he explained recently via email. "Smithsonian Channel produces a lot of aviation-themed series, partially due to their association with the National Air and Space Museum. The NTSB has the responsibility for promoting safety in American aviation, but it has often been overlooked. Alaska's challenging conditions, and it dependency on aviation makes it a natural environment to show the NTSB at work." Revealing to viewers how complex an investigator’s job can be is a key part of "Alaska Aircrash Investigations." 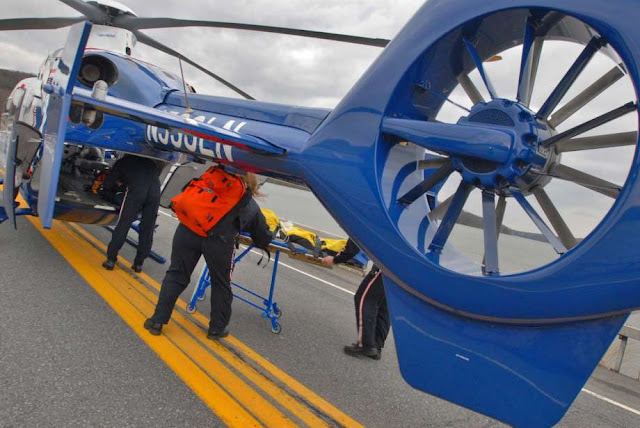 There is not only the difficulty of physically getting to some crash sites but also, as evident in accidents in Trapper Creek and Knik Arm, the sensitivity crucial when interacting on-site with the public. In several of the episodes, studio interviews were also conducted with family and friends who spoke movingly about the pilots. It is the hands-on science and physics used by the investigation team that viewers will likely find most interesting. As revealed in the show, using what the NTSB refers to as the "Party System," the investigations include specialists from the airframe and engine manufacturers when analyzing the wreckage. Certain avionics equipment is shipped to Washington, D.C. for analysis and medical personnel, human performance investigators, meteorologists and air traffic control specialists will contribute if needed. Local representatives from the FAA, which is legally mandated to be a party system member, also may participate. The efforts of all these individuals combine under the lead NTSB investigator, who builds a case to determine probable cause. The slow, precise detective work to get to that point might appear dull to viewers accustomed to the excesses of reality television, but is rarely in the public eye even though the final reports are available online. “We are not on the shiny side of aviation,” NTSB Alaska region Chief Clint Johnson acknowledges in the program, and several of the investigators discuss the heavy responsibility of speaking to family members on “their most difficult day." But as “Alaska Aircrash Investigations” makes clear, the work of the NTSB is the only way people will ever know what went wrong and -- especially in aviation-dependent Alaska -- an effective way of bringing positive change to the flying environment. PITTSFIELD, Mass. — PERC President Jay Anderson doesn't think the development of the Westwood Center at Pittsfield Municipal Airport would have happened without FAA approval. But the only correspondence with the Federal Aviation Agency is a letter disapproving of the leases. Now, a study group is worried that the city could ultimately be on the hook to pay the FAA back for some 30 years worth of leases. The issue was first brought up in March. In the research so far, it seems there are two federal programs that should have gotten leasing funds on seven parcels. The city purchased five acres of property abutting airport land and the airport put forth 25 acres of land for the center. The city developed the 30 acres for $506,000 with Community Development Block Grant funding and about $75,000 estimated as the airport's contribution via land value. The federal Department of Housing and Urban Development administers the CDBG program and requires all income generated to be used for eligible projects. In 1984, the Pittsfield Economic Revitalization Corp. was formed to receive the lease revenue and use it for CDBG activities such as business loans and grants. However, the FAA also requires that all revenue generated from airport property needs to go back to the airport. "They want all of your revenues going back into aeronautical use," Airport Commission Chairman Chris Pedersen said. At the time, an agreement was reached with the Airport Commission that 15 percent of the leases — equivalent to its portion of the development — goes back to the airport and 85 percent goes to PERC. The business park generates around $20,000 each year, with $3,000 going to the city for the airport and $17,000 going to PERC. "[The leases] were all properly executed. 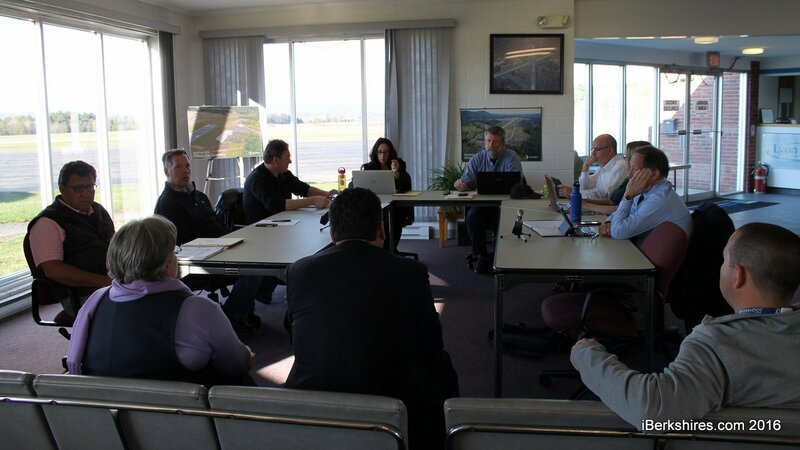 They were all signed off by the Pittsfield Airport Commission," Anderson said. Pedersen said those 25 acres were purchased by the FAA and in order to construct the park, the FAA would have had to declare the land was excess and could be developed. But the only documentation he can find is a letter from 1986 from the FAA saying it did not approve. "It seems as if either another deal was struck or it was ignored," Pedersen said. Pedersen says now that the leases have come to light, officials know there has been non-compliance with the grant assurances, they need to find a resolution. Anderson, however, says he doesn't believe the airport is out of compliance because if city, state and federal officials at the time went through the trouble of creating PERC and developing the land, it doesn't make much sense that the FAA approval was never sought. "I find it odd that somebody would go this far without approvals," he said. Former City Councilor Jonathan Lothrop said moving forward, compliance could be a simple fix. Right now the airport is being subsidized by the city so simply creating a "Westwood leases" budget line and funded at the total amount of the leases would be enough of an accounting process to satisfy the FAA requirement on how the revenue is being used. Another option could be to sell the park to pay the FAA back for the land. But, that doesn't resolve the threat of being audited and being forced to pay 30 years worth of leases, which is the fear of members on the research committee. "We've opened up this issue and we have to have a solid foundation moving forward," said Ward 5 Councilor Donna Todd Rivers. Lothrop, however, reminded the group that had the park never been developed, there wouldn't have been any income. Not only is $20,000 or so generated through the land leases, the companies built buildings that are now taxed, generating an estimated $75,000 worth of tax revenue. "We've created jobs. We've created tax revenue. And we've created revenue for the Airport Commission," Lothrop said. In the future, Pedersen said the accounting would be smoother if an enterprise fund was created. Right now that $3,000 goes into city coffers and then is allocated back. Each year, the city supplies supplemental funding to keeping the airport afloat. While the enterprise fund is fairly irrelevant because of the city's contribution, Pedersen said his goal is to make the airport "revenue positive" and a designed airport enterprise account would be vital. While the leases at the business park had been a center of conversation multiple times during the research phase, the group is continuing to look at raising fees and analyzing the long-term debt. Ward 4 City Councilor Christopher Connell said he'd like to see other models of management be looked at — including leasing the entire operation to a private company. "That takes us out of the mix and we would only have to worry about the long-term debt," Connell said, adding that a private company would be "more aggressive" in seeking revenue. Pedersen responded that even if the management was outsourced — as it had been in the past — there is still a require that there is an Airport Commission and the property maintenance would likely still be on the city's shoulders. The airport is managed and maintained by a two-man crew. Lyon Aviation is the fixed-based operator which handles billing and the fuel services. Connell is also looking at trying to get other communities to chip in for the cost since not all traffic is coming and going for Pittsfield. But, there is nothing to bring those communities to the table nor a way to track where the passengers are going or spending money. He added if not, the city should raise the landing and fuel fees to increase revenues. Airports are competitive when it comes to revenues so pricing too high could cause more harm than good. "You might push your business away by increasing," Assistant Airport Manager Brian Spencer said. Michael Lyon of Lyon Aviation said the local fuel tax charge could go up modestly without harming the business too much. But if all of the fees go up, it could drive traffic away. He said he'd like to see a full proposal of fees before agreeing to raise any prices. Connell also questioned the cost of maintaining a number of pieces of equipment. The airport is eligible to receive free equipment from military surpluses, including forklifts, sport utility vehicles or parts. "The cost to repair and maintain some of these vehicles, especially military grade, can be very expensive," Connell said. Spencer said he is "mechanically inclined" and can maintain the equipment. He said all of the pieces have purposes, such as using the forklift to move tables and boulders. A Hummer SUV was picked up because it has high clearance and is more durable to use for fence inspections that the prior pickup trucks that were getting damaged during the rounds. "If I use it once throughout the year and it didn't cost us anything but oil, why not?" Spencer said, adding that it makes the work more efficient and the equipment is required to stay on site for only a year. "I'm not just saving the airport money. I'm saving the city money." Spencer said he can't "buy things for the city" but there are some city vehicles that are used at the airport. For example, if the transmission blows on the "snow fighter" used at the airport, he can get the surplus to fix it so the city doesn't have to. The sport pilot of the tailwheel-equipped airplane had completed one touch-and-go landing uneventfully on a 6,201-ft-long, 100-ft-wide asphalt runway. During the second landing, the tailwheel began to "shimmy." Rather than apply forward control stick pressure to reduce weight on the tailwheel and alleviate the shimmy, the pilot held the control stick fully aft as the airplane departed the left side of the runway and impacted an approach path indicator light. Examination of the tailwheel locking mechanism revealed that it was worn and had unlocked during touchdown. The pilot should have been able to compensate for a tailwheel shimmy at touchdown by reducing the weight on the tailwheel. The condition of the tailwheel locking mechanism should have been checked during the last annual inspection; however, it is possible that the locking mechanism could have worn further during the 7 months between the most recent inspection and the accident flight. The disengagement of the tailwheel locking mechanism during the landing roll due to wear, and a subsequent loss of directional control. Contributing was the pilot's inadequate remedial action, which resulted in a runway excursion. On April 30, 2015, about 1615 eastern daylight time, an American Champion Aircraft 7AC, N85510, was substantially damaged while landing at Dillant-Hopkins Airport (EEN), Keene, New Hampshire. The sport pilot and passenger were not injured. The airplane was privately owned and operated. The personal flight conducted under the provisions of 14 Code of Federal Regulations Part 91. Visual meteorological conditions prevailed and no flight plan was filed for the local flight, which originated from EEN about 1610. The sport pilot reported that he had completed one touch-and-go landing uneventfully at EEN and was planning a second landing to a full stop. He performed a three-point touchdown on runway 2, a 6,201-foot-long, 100-foot-wide, asphalt runway. The pilot added that during the touchdown, he held the control stick completely aft, when the tailwheel began to "shimmy" and the airplane departed the left side of the runway. The airplane traveled over grass and impacted an approach light indicator, before coming to rest upright. The pilot further stated that the tailwheel on that particular model was supposed to remain locked during landing, but had unlocked at touchdown. The sport pilot had accumulated a total flight experience of 115 hours; of which, 85 hours were in the same make and model as the accident airplane. He had flown 2.5 hours during the 90-day period preceding accident, and those hours were in the same make and model as the accident airplane. The two-seat tandem, high-wing, tailwheel airplane was manufactured in 1946. It was powered by a Continental Motors, C-85, 85-horsepower engine. The airplane's most recent annual inspection was completed on September 19, 2015. At that time, the airplane had accumulated 3,715 total hours of operation. The engine had accumulated 2,345 total hours of operation; of which, 545 hours were since its last major overhaul. The airplane had flown about 7 hours from the time of the last annual inspection, until the accident. Examination of the wreckage by a Federal Aviation Administration inspector revealed damage to the fuselage and right wing. The inspector also observed that the tailwheel locking mechanism appeared worn. 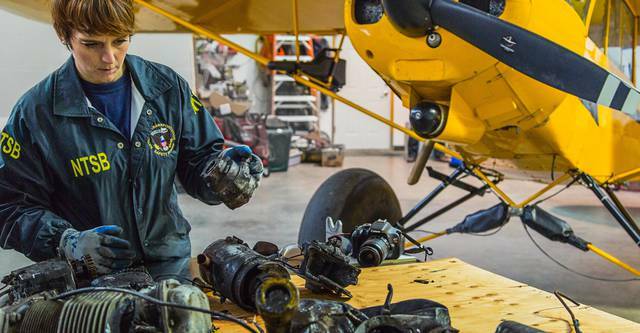 The inspector added that the condition of the tailwheel locking mechanism should have been checked during the last annual inspection, but that the locking mechanism could have worn during the 7-month period from the time of the most recent annual inspection, until the accident. The recorded weather at EEN, at 1615, included wind from 210 degrees at 7 knots, visibility 10 miles, and clear sky. 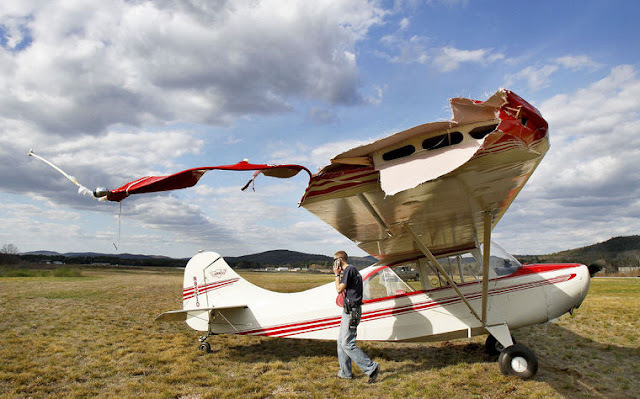 On April 30, 2015, about 1615 eastern daylight time, an American Champion Aircraft 7AC, N85510, was substantially damaged while landing at Dillant-Hopkins Airport (EEN), Keene, New Hampshire. The sport pilot and passenger were not injured. The airplane was registered to and operated by a private individual as a personal flight conducted under the provisions of 14 Code of Federal Regulations Part 91. Visual meteorological conditions prevailed and no flight plan was filed for the local flight, which originated from EEN about 1610. The sport pilot reported that he had completed one touch-and-go landing uneventfully at EEN and was planning a second landing to a full stop. He performed a three-point touchdown on runway 2, a 6,201-foot-long, 100-foot-wide, asphalt runway. The sport pilot added that during the touchdown, he held the control stick completely aft, when the tailwheel began to shimmy and the airplane departed the left side of the runway. The airplane traveled over grass and impacted an approach light indicator, before coming to rest upright. The sport pilot further stated that the tailwheel on that particular model was supposed to remain locked during landing, but had unlocked at touchdown. Examination of the wreckage by a Federal Aviation Administration inspector revealed damage to the fuselage and right wing. The inspector also observed that the tailwheel locking mechanism appeared worn. Monadnock Aviation manager Chris DeLaVergne relays information at the site of a small plane crash at Dillant-Hopkins Airport in Swanzey on Saturday afternoon. A strong crosswind during landing is thought to be the reason for the crash. Neither the pilot nor a passenger was injured, but the small plane was damaged. NORTH SWANZEY — A small plane had a rough — and likely expensive — landing at the Keene Dillant-Hopkins Airport Saturday afternoon. Keene Fire Chief Mark F. Howard said the single-engine recreational aircraft was coming in from the south to land at the airport when it went off the west side of the main runway. Two people were on the plane, but no injuries were reported, he said. However, the plane took down at least five lights along the runway, which caused damage to the aircraft, he said. He said airport staff were contacting the Federal Aviation Administration to report the crash. Chris De LaVergne, a manager with Monadnock Aviation, said the plane sustained moderate damage, but it would be hard to determine if it was salvageable until a mechanic looked at it. He said he couldn’t release information about who owns the plane, which was company policy. Airport Manager John G. “Jack” Wozmak, in a phone message left Saturday evening, referred all inquires about the crash to the Federal Aviation Administration. The crash was reported at 4:30 p.m.; members of the Keene and Swanzey fire departments responded to the scene. Albany -- Leigh Campbell got quite a shock in the predawn hours of April 3: Twenty-seven weeks pregnant, his wife Heather went into early labor. The couple, who live in Ray Brook in Essex County, rushed to the hospital in nearby Saranac Lake. But because that facility lacks a neonatal intensive care unit, their midwife called for a helicopter to bring Heather to the nearest open bed across Lake Champlain in Burlington, Vt. They avoided a premature birth — at press time, Heather remained in the hospital waiting to bring her baby to term. But the second set of shocks came two days later with the realization that the helicopter bill was $59,999 and Heather's insurance carrier would only cover about $370 for the 25-minute flight. The service provided by the helicopter company, LifeNet, was "out of network" and therefore not covered in her health insurance policy. Large bills for out-of-network services aren't uncommon, and have long been a source of contention between insurance companies and their customers. There's an added twist, said Campbell, who began researching the air ambulance industry after receiving the bill. Because they describe themselves as air carriers, the companies claim they aren't subject to price restrictions. When it comes to aviation, federal regulation takes precedence over state rules. And the federal government deregulated airline rates in the late 1970s. Each day, Campbell, an Army veteran who served in Iraq, has been driving back and forth from his job as a graphic designer in the Adirondacks to the hospital in Burlington. Now, with the stress of the lengthy commute, the 31-year-old worries about his wife's health. And then there's the nearly $60,000 helicopter bill. LifeNet is a subsidiary of the Englewood, Colo.-based Air Methods, whose representatives didn't respond to phone calls or emails late last week. The company has been the subject of several critical stories in national media that have made note of its prices, and its tendency to pursue payments through bill collectors or legal action. Its home page describes its personnel as "Defenders of Tomorrow" dedicated to "quality of care to patients & safety in aviation." The page also lists the company's stock price on the NASDAQ exchange. 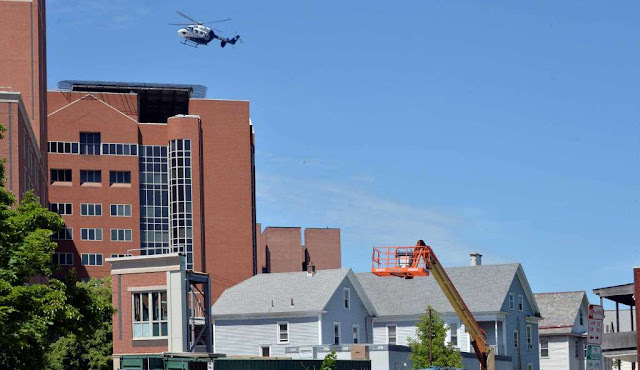 LifeNet is a relative newcomer to the North Country, arriving in the Watertown area several years ago to fill a void that opened when the nearby Fort Drum Army base stopped providing free emergency helicopter airlifts. There had been a program at Fort Drum known as Military Assistance to Safety and Traffic, but it was moved in 2007 to Fort Lewis in Washington state. Air Methods has operated elsewhere in New York, sometimes drawing controversy. One patient, New Paltz lawyer Diana L. Kidd, countersued the company after it brought legal action to collect a $36,646 bill for flying her from Catskill to the Westchester Medical Center following a motorcycle accident. According to press reports, Kidd contended that a regular ambulance would have gotten her there in less than the 115 minutes she said she was billed for. Kidd couldn't be reached on Friday. The Campbells' bill breaks out the charges into mileage — 51 miles for $23,062 — and the "Helicopter Rotor Base," for $36,936. Transport to a major hospital from deep in the North Country can be daunting, given the distances. "It's in the middle of the Adirondacks," remarked Eileen Mowrey, spokeswoman for Saranac Lake's Adirondack Medical Center, where the Campbells first went. She wasn't commenting specifically on the Campbells, but explained that people in an emergency such as theirs need to use whatever option is available at the time. The area has a volunteer group of paramedics who can fly with services such as State Police helicopters but those weren't available that morning. Driving from Saranac Lake to Burlington, a 71-mile road trip, takes about two hours. However, individuals familiar with rescue services noted that getting a helicopter in the air from its base near Watertown, then flying 112 miles to Saranac Lake, loading it and traveling on to Burlington can take close to two hours as well. State and health insurance officials said the Campbells have several avenues they can pursue. The Affordable Care Act, also known as Obamacare, provides an extra level of potential appeals regarding charges racked up from non-participating providers. And state Health Plan Association spokeswoman Leslie Moran noted that since last year, consumers in New York can use an independent arbitrator to appeal payment issues for out of network charges. While not commenting on the Campbells or Air Methods, she also wondered if such services sit purely in the aviation rather than health care category. "They are putting themselves out there as medical transport," she noted. The pilot reported that when he aborted the landing due to gusty wind conditions, the airplane drifted to the left of the runway and impacted a fence. The pilot's failure to maintain directional control during the aborted landing in gusty wind conditions, which resulted in a collision with a fence. 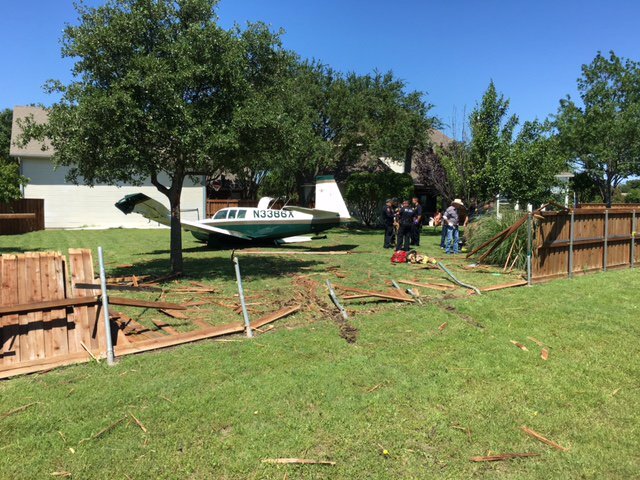 PLANO, TX -- A small plane made an emergency landing in a Plano yard late Sunday morning. According to the Plano police department, the incident happened around 11:23 a.m. in the 1900 block of Airpark Lane. The scene is near Air Park-Dallas Airport. The plane crashed through a fence and came to rest in a yard. The Federal Aviation Administration is investigating why a plane made a hard landing in a backyard in Plano Sunday. The FAA says a Mooney M20 was traveling from Lubbock to Air Park-Dallas Airport in Collin County. 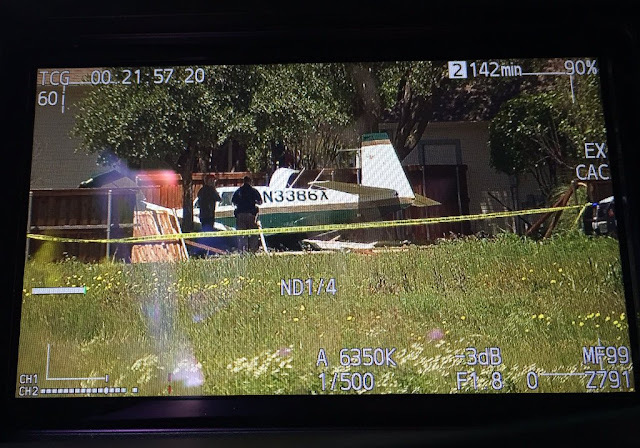 The Texas Department of Public safety says the pilot, realizing he was coming in too fast for landing attempted a touch and go, but instead veered to the left. 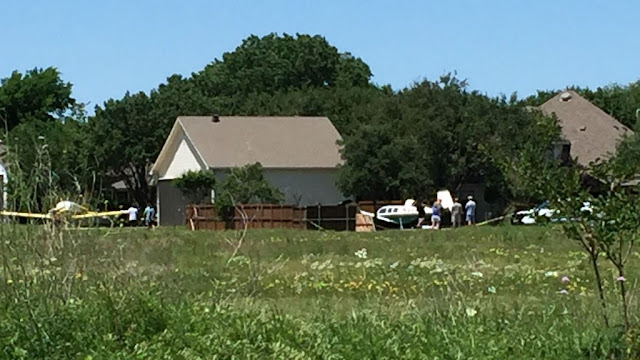 DPS troopers say the plane went through a fence and came to a stop in a backyard in the 6300 block of Douglas Street. Neither the pilot, his passenger or anyone outside the plane was injured. The FAA is investigating. 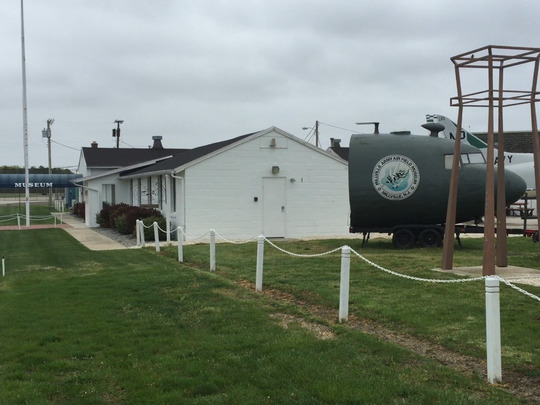 MILLVILLE – The Millville Municipal Airport’s historic preservation district may shrink in the near future under pressures to open key areas for development while cutting maintenance costs for the Delaware River and Bay Authority. Whether the idea becomes a reality relies in part on political finesse, since the city and the authority can’t move alone. The issue draws in the New Jersey Historic Preservation Office, which set the boundaries for the district and approved it. 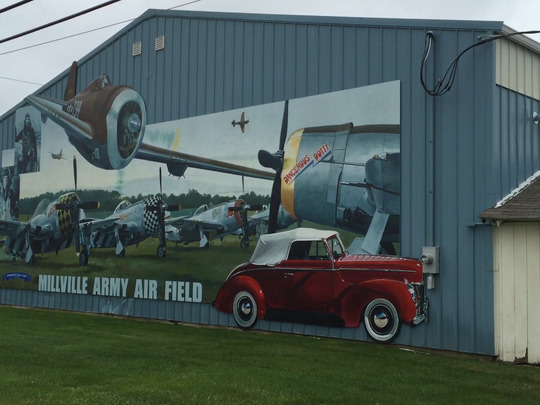 The city and the authority also want the Millville Army Air Field Museum’s support, or at least its neutrality. It was the museum that sought historic status for a portion of the airport in order to support its mission to preserve the airfield’s wartime legacy. 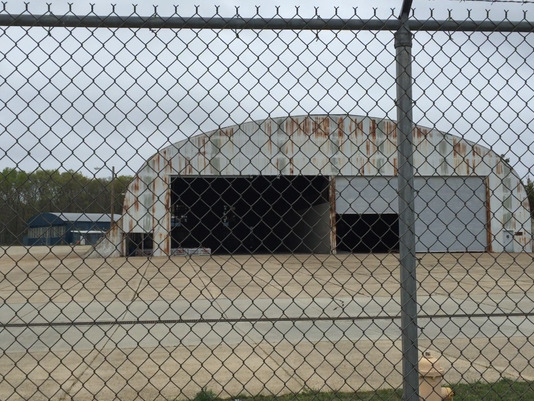 One very visible impact of a downsized historic district boundaries would be the demolition — or, much more unlikely, removal — of the “Q hangar.” The Q hangar is in a fenced off area between the Dallas Airmotive property and a modern hangar last leased by Boeing for helicopter remanufacturing. The Q hangar was built in the early 1940s when the airfield opened as the nation’s first U.S. Army air defense base. Like its contemporaries, it is in bad shape after 75 years. However, historic district rules prevent demolition of structures within the district that otherwise could be condemned. The DRBA, which operates the airport under a long-term lease with the city, already has held talks with city officials about the idea. DRBA spokesman James Salmon said 75 percent of airport properties are in the designated historic area. “Many of them are in poor condition and require significant resources to maintain — resources that could otherwise be used for other development initiatives,” Salmon said. “We understand and value the need to preserve history, but we also want to unlock development opportunities at Millville. "Currently, the historic district includes both sides of Peterson Street," he added. "We'd like to see the district reduced with Peterson Street as a border." Mayor Michael Santiago and City Commissioner Joseph Sooy indicated support for the proposal during a rambling discussion of the situation at the April meeting of the city’s Industrial Commission. The City Commission has not addressed the issue publicly, yet. It may wait to do so until the Industrial Commission puts itself on the record about the proposal. “The historic property there is really killing us,” Santiago told Industrial Commission members. Sooy, likewise, said the hangar “doesn’t make sense economically” and takes up a useful parcel of land. Santiago said he had just asked a representative of the Governor’s Office for support on the issue. “So, we’ll wait for a response,” he said. Museum President Chuck Wyble recently said the Q hangar undeniably is “in deplorable” condition. “The fact that it is still standing has been a mystery to us, frankly,” he said. Still, Wyble said, museum officials are cautious about being seen taking sides. The museum recognizes that the district places financial and operating burdens on the DRBA and the city. “We certainly recognize the importance of the historic district,” Wyble said. “We certainly recognize the DRBA being liable and responsible for all these buildings that, for the most part, were temporary buildings. No one expected them to be up 75 years later. Wyble also stressed that the museum originally envisioned a much smaller historic district. State officials drew the boundaries. 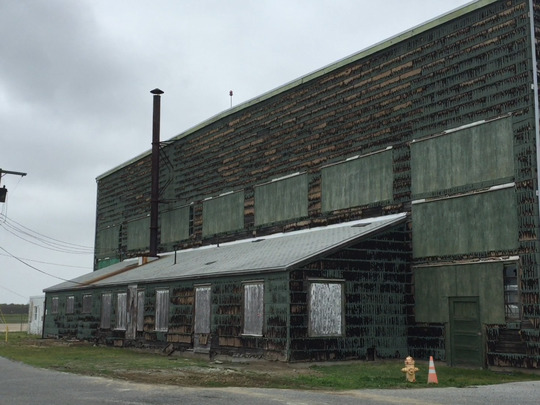 The Green hangar’s name reflects its original green siding. The hangar, also built during the war, is empty but there is considerable interest in its restoration in the public and private sectors. A study done about nine years ago estimated it would take about $2.3 million to restore it. Wyble said the Green hangar has gotten attention from Monte Motorsport, a company leasing part of the Dallas Airmotive. In early 2004, two barracks and a small hangar were razed and left cleared. That was while the historic district was only a proposal. 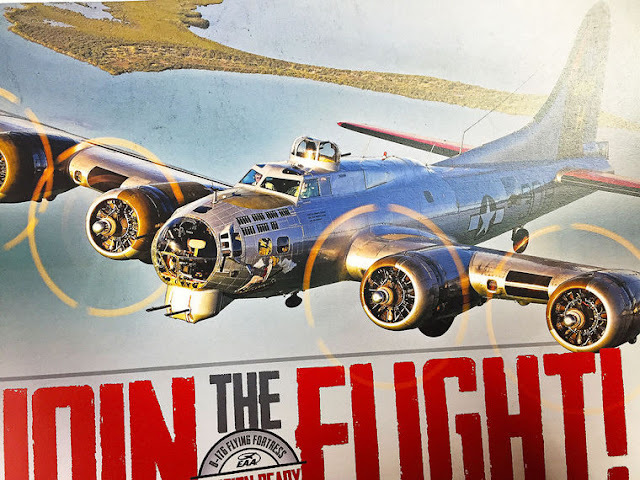 A poster with the photo of a B17G Aluminum Overcast World War II bomber advertises the upcoming event on Tuesday at North Platte Regional Airport. Tours and rides may be purchased on this historic aircraft. World War II airplane aficionados can look forward to a local visit from a B17G Aluminum Overcast bomber on Tuesday, May 3, at North Platte Regional Airport. Tim Liewer, local chapter president of the Experimental Aircraft Association, is coordinating the event. “The purpose of this event is to honor, respect and educate people about the sacrifices made in WWII,” Liewer said. The Experimental Aircraft Association is a nonprofit group that helps bring historic aircraft to North Platte. Rosie the Riveter is a cultural icon of the United States, a nickname for American women who worked in factories and shipyards during World War II, many of whom produced munitions and war supplies. Local resident Ed Martens was a captain on a B17. Martens stayed with the plane when the fire went out and flew solo to France, Liewer said. His crew spent the rest of the year in a prison camp. The public will have several options to enter and view the B17 on Tuesday. Ground tours will take place from 2-5 p.m. Cost for the ground tours is $10 for individuals; children 8 years and younger with a paid adult enter free. Families can enter the plane for $20, while veterans and active military may tour for free. There is another interesting option between 10 a.m. and 1 p.m. for those who would like to experience a flight. The cost for EAA members is $435 and for the general public $475, which includes a one-year membership in the EAA. Liewer, of Hershey, has been interested in aircraft since he was 19 years old. He is also a pilot. For more information, call Liewer at 530-6547; to pre-book a flight for Tuesday’s event, go to the EAA website at B17.org. Liewer said a retired farmer from Kansas booked a ride on the plane on Tuesday as well. Airline trends and the consequences of congressional demands on training have combined to make it more difficult to recruit pilots to regional markets and that is hampering facilities such as Lawton-Fort Sill Regional Airport. Airport Director Barbara McNally said she found the report received at an air service development conference to be especially applicable to Lawton-Fort Sill, where the airport's governing board has worked hard in recent years to keep communication lines open with American Eagle, the carrier that links Lawton to Dallas-Fort Worth via daily flights. Members of the Lawton Metropolitan Area Airport Authority have been pushing for additional flights to and from the airport, pointing to strong passenger levels, especially on weekends. McNally and the board also noted that enplanements (the number of passengers boarding flights in Lawton) were up in March, with more passengers in March 2016 than the airport has recorded since March 2012. McNally said she has been told Lawton's load factors are so good American Eagle doesn't expect any changes in flights. But, the number of flights are based on more than load factors. There also is the simple availability of flights and the pilots to fly them. McNally said the regional pilot issue, discussed at a conference she attended in late March, was especially interesting because of its focus on markets such as Lawton-Fort Sill. Airport officials at Lawton and other regional facilities have long decried the problems of maintaining sufficient flights and major carriers have said the problem is caused, in part, by an inability to recruit and keep pilots to handle flights in regional markets. McNally said part of the issue can be traced to changes implemented by the U.S. Congress in the aftermath of an airline crash in 2009 in New York. The crash of Colgan Air Flight 2407 was found to be inadequate response by the flight crew to a stall. The crash, which killed everyone on board and one person on the ground, led to the Airline Safety and Federal Aviation Administration Extension Act, which increased regulations governing pilot training. LaSill Aviation has withdrawn its request to be released from its contract as the fixed base operator for Lawton-Fort Sill Regional Airport. The owners of LaSill Aviation made their initial request in early March as the airport's governing board debated a decision to ban large aircraft, or "heavies," from landing at the airport as a means of preserving a runway that has begun to show signs of serious deterioration in some areas. Members of the Lawton Metropolitan Area Airport Authority agreed on a split vote to give Airport Director Barbara McNally the authority to make exceptions, but said heavies no longer would be allowed to routinely land at the airport. The decision affects chartered commercial jets as well as large military transport flights, which have made arrangements to land at other airports. The decision does not affect military training flights, general aviation or commercial flights by the airport's carrier, American Eagle. That ruling by the airport authority prompted LaSill's decision, with officials saying last month that without military transport traffic "LaSill cannot remain a financially sound business." In a letter dated March 10, the firm asked to be released from its contract effective June 1 and had asked for a rate reduction for its remaining time in operation. As the fixed base operator, LaSill sells fuel to aircraft that land and take off from the airport, and officials there said heavy aircraft provided much of their business. Losing those aircraft as customers would have an impact on revenues, they said. In a letter dated March 24, LaSill Aviation withdrew its initial request to end its lease, a request the airport authority acknowledged at its April 26 meeting. Without going into details, co-owner William Tipton said the firm has learned "of some new factors in regards to the runway problems and heavy military aircraft issues." The owners asked to rescind the request for release from the lease until they have had a chance to evaluate those factors and noted they would "notify you as soon as we have all the new facts and can determine if being released from our current leases are still the only option." 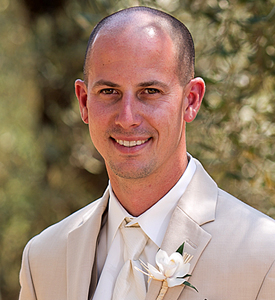 Steven Anthony Peterson of Sonoma County, passed away on April 30, 2016 at the age of 32. Benjamin Anderson Soyars, III, "Ben", age 37, died on April 30th, 2016 while living in Nevada. On April 30, 2016, about 1624 Pacific daylight time, an EXTRA Flugzeugproduktions-und Vertriebs, EA-300/L airplane, N330MT, was destroyed when it impacted terrain about 10 miles south of Henderson Executive Airport (HND), Las Vegas, Nevada. The airline transport pilot and passenger were fatally injured. 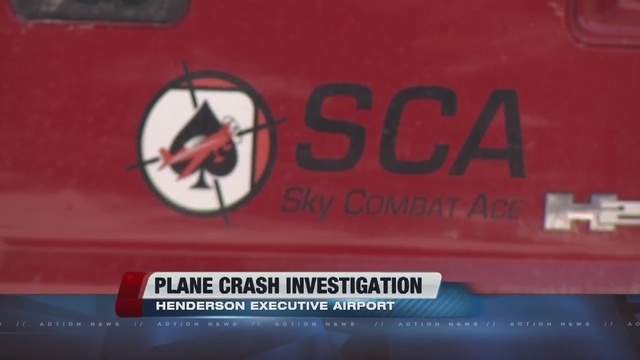 The airplane was registered to and operated by Vegas Extreme Adventures LLC, doing business as Sky Combat Ace (SCA), under the provisions of 14 Code of Federal Regulations (CFR) Part 91. Visual meteorological conditions prevailed, and no flight plan was filed for the local instructional flight, which departed HND about 1603. The accident airplane departed and rendezvoused with two other company airplanes to conduct a simulated air-to-air combat mission. The mission profile included two airplanes at a time maneuvering against each other, while the third airplane observed from a higher altitude and safe distance. Following completion of the air combat mission, all three airplanes began the return flight to HND. During the return, the airplanes flew a planned low-level bombing run simulation. After landing at HND, the pilots of the first two airplanes realized that the third airplane had not returned. The operator's pilots subsequently notified HND tower and the company. The company initiated an aerial search, and the wreckage was located shortly thereafter. The accident airplane was equipped with both a GoPro Hero and a Garmin VIRB onboard camera system. The GoPro Hero camera was mounted in the front seat instrument panel and faced backwards, in order to record the front seat occupant. The Garmin VIRB camera was forward facing and mounted on the right side of the rear seat at the instrument panel. Both cameras were recovered from the accident site and sent to the NTSB's Vehicle Recorder Laboratory for download. The GoPro Hero card contained two files that captured the accident flight. The Garmin VIRB card captured the accident flight and cockpit communications. A complete report on the recorded flight data is available in the public docket. The recorded data began on the airport ramp area and revealed weather conditions that included scattered clouds and a high overcast layer. The accident pilot and passenger discussed the recent weather as rain droplets collected on the airplane's surfaces. Both the pilot and passenger were wearing parachutes. The passenger was seated in the front seat and the pilot was seated in the rear seat. Another company airplane (Ace 4) checked the formation in on the radio and called for taxi clearance, for the three airplanes. The accident airplane (Ace 1) began taxing behind Ace 4 (the lead airplane): the other airplane in the formation was Ace 2. The timing of the recorded data referenced below, is expressed in video elapsed time, which is the minutes and seconds from the beginning of the recordings. At 08:55 elapsed time, the accident airplane took off from runway 35L. After reaching about 200 ft agl, as indicated by the altimeter in the forward panel, the pilot initiated a hard left turn. The airplane climbed to its cruise altitude of 3,500 ft msl. At 11:40, the three airplanes flew south towards the practice area and accomplished a simulated gun check. The accident pilot led the passenger through some shallow bank maneuvers, where they simulated setting up to shoot another airplane. The altimeter indicated 3,900 ft msl. At 15:00, the airplanes continued to fly south, and the accident airplane was instructed to set up to watch the Ace 4 and Ace 2 maneuver for a simulated "dogfight." The altitudes given to maintain for the simulated dogfight were between 5,000 ft and 7,000 ft msl. The accident airplane maneuvered in slight banking turns as the other two airplanes maneuvered for a simulated dogfight. At 18:30, the first dogfight between the other airplanes had ended. The accident airplane was then instructed to set up for the next simulated dogfight. At 19:38, the accident airplane maneuvered for their first simulated dogfight. The passenger appeared to be manipulating the controls. After about 2 minutes, the dogfight was terminated and another one shortly thereafter. At 23:15, the pilot asked the passenger how he was doing? The passenger responded that he was "doing pretty rough." The pilot asked the passenger to let him know if he started to feel airsick and the passenger confirmed that he was ready for one more simulated air-to-air engagement. At 23:35, the accident airplane began a third simulated engagement and achieved a successful "kill" at 24:38. At that time, the pilot, indicated that he was going to stop the simulated dogfighting with the other airplanes and set up to watch them. The accident airplane climbed to 7,000 ft msl, and the passenger expressed that he was "not feeling well." The accident pilot responded that he "would not be doing any crazy turning or anything like that." At 25:35, Ace 4, radioed that he was calling off the next simulated dogfight and the flight of three would return to HND. Ace 4 informed the other airplanes that during the return their position would be "fighting wing" with the accident airplane as the last airplane in trail. The pilot of another airplane in the formation radioed that they would finish up flying a low-level bomb run. The accident pilot informed the passenger, that he would keep it smooth for him, then radioed the formation that he was going to "keep it pretty PG back here." The other pilots in the formation acknowledged and replied: "sounds good, you guys tame it down to however you like it." As the accident airplane descended towards the desert floor, the passenger readied an air sickness bag. The accident pilot restated that he was going to keep the airplane nice and smooth and instructed his passenger to take care of himself. Shortly, thereafter, the accident passenger became actively airsick and adjusted his headset microphone away from his face. The accident pilot transmitted over the radio that "One's code three." At 28:51, the accident airplane was flying low level over the desert floor. The front seat altimeter indicated 2,750 ft msl and the indicated airspeed 185 knots. The passenger continued to be actively airsick. At 28:56, the passenger began to tie off his airsickness bag. Rain was seen beading up on the accident airplane's windscreen and the sky condition was overcast with a high ceiling, similar to the weather conditions observed during the simulated dogfights. At 29:26, the accident airplane began climbing as it approached a ridgeline. Despite the rain accumulating on the windscreen, the forward visibility appeared to be unobstructed and the ridgeline was not obscured by cloud cover. At 29:37, the accident airplane was in a shallow climb and the accident pilot transmitted "you guys are leaving some pretty sweet vapor trails." At 29:46, the shallow pitch increased slightly, and the rain continued to bead on the airplane's canopy. The rain did not obstruct the forward view and the ridgeline was still clearly visible. The airplane's airspeed indicator read about 175 knots and the altimeter indicated 3,150 ft msl. The accident pilot then stated, "I'm going to take it nice and easy here." The airplane continued to approach the ridgeline in a shallow climb and an indicated airspeed just over 170 knots. The forward facing, Garmin VIRB camera stopped recording as the accident airplane was just approaching the ridgeline of the dry lake bed about 15 seconds before impact. The GoPro Hero camera recorded the accident airplane perform 3 check turns before crossing the ridgeline and one after. The airplane crossed the first ridgeline and leveled off briefly and then began a shallow wings-level descent. There was some rain beading on the canopy; however, the visibility around the airplane was not degraded. The airplane then rolled into a slight right turn as it continued to descend towards the valley floor. Seconds later, the passenger was seen yelling: however, his microphone was not near his mouth. Almost simultaneously, at 30:18, the airplane impacted a small hill that rose from the valley floor. At the time of impact, the airplane was in a slight left bank and shallow climb. The accident pilot did not indicate any anomalies before impact and the airplane was in stable flight with no attempted maneuver to avoid terrain. Video from Ace 2 was also reviewed. Ace 2 was flying as the number two position in the formation, in front of the accident airplane. Ace 2 was maneuvering at a low attitude on the desert floor near the Jean dry lakebed and appeared to be flying about the same altitude above the ground as the accident airplane. Rain impacted Ace 2's windscreen as it maneuvered around a ridge adjacent to the dry lakebed. The rain did not appear to significantly degrade visibility and Ace 2 remained in VFR conditions. When compared to the accident airplane's video, Ace 2 encountered heavier rain. The flight path where the accident airplane was observed, was west of their position and the weather conditions near the accident airplane appeared to be better. Ace 2 cleared the ridgeline and performed slight clearing turns as it descended back towards the valley floor. Once it reached level flight just above the valley floor, the accident airplane came into view behind and could be seen descending towards the valley floor. Once the accident airplane crossed above the first ridgeline, it was difficult to see, because it was no longer silhouetted against the overcast skies. A small hill comprised of rocks came into view behind and to the left of Ace 2, where the accident airplane was flying. Moments later, a white plume was observed on top of the hill. During the low-level, Ace 2 performed 8 clearing turns during the low-level flight before the accident. Following the accident, Ace 2 continued flying normally and the pilot and passenger seemed to be unaware of the accident airplane's impact with terrain, since the impact occurred outside their field of view. The pilot, age 37, held an airline transport pilot certificate with ratings for airplane single and multi-engine land. He also held a flight instructor certificate with airplane single and multi-engine ratings. The pilot was issued a first class Federal Aviation Administration (FAA) airman medical certificate on September 2, 2014. At the time of the accident, this medical certificate was valid only for third class purposes with no limitations. The pilot reported on the application for that medical certificate that he had accumulated 7,118 total hours of flight experience, with 200 hours in the previous 6 months. Information provided by the operator revealed that the pilot had over 17 years of professional flying experience and had been flying aerobatics for 19 years, in a variety of aerobatic airplanes. He had been employed by SCA since August 2015. According to the other pilots in the formation who flew against him on the day of the accident, the pilot appeared to be in good health and disposition. According to SCA, the accident pilot had taken the previous 2 days off and the accident flight was his second flight of the day. He had routinely flown the EA-300/L on company missions throughout his employment with SCA. The tandem-seat, low-wing, acrobatic-category airplane was equipped with dual controls and was manufactured in 2011. A review of maintenance logbooks revealed that the most recent annual inspection was completed on January 2, 2016, at an airplane hour meter time of 619.9 hours. The engine received a 100-hour inspection on February 23, 2016, at an hour meter time of 719.3 hours and 719.3 hours since overhaul. During the accident flight, the flight instructor was seated in the rear seat, and due to the tandem seating configuration, forward visibility was restricted by the forward portion of the airplane. No specific information about the rear seat visibility was available from the manufacturer, however, utilizing airplane drawings from the manufacturer, forward visibility from the rear seat, during level flight, was estimated to be limited between 7.5° left and right of centerline, and below more than about 8° below the nose of the airplane. The rear seat visibility limitations do not account for the additional limitations potentially imposed by the front seat passenger. The airplane's Pilot Operating Handbook states that solo flights will be accomplished from the rear seat. At 1636, the automated weather observation station at HND, reported wind from 120° at 8 knots, visibility 10 statute miles, few clouds at 4,100 ft, scattered clouds at 7,000 ft, overcast cloud base at 9,500 ft, temperature 16° C, dew point 9° C, and an altimeter setting of 29.79 inches of mercury. Remarks included: station with a precipitation discriminator, wind shift at 1555, lightning more than ten miles away to the north and northeast, thunderstorm ended at 1630, and rain began at 1559, and rain ended at 1620, trace precipitation in last hour. An unofficial meteorological reporting station located about 6 miles east-southeast of the accident site, reported wind from 011° magnetic at 11 mph at 1625. Another unofficial meteorological reporting station located about 5 miles south of the accident site, reported wind from 074° magnetic at 8 mph at 1627. Weather radar imagery depicted high reflectivity values consistent with heavy rain and reflectivity patterns consistent with convection moving through the accident site immediately before the accident time. About 1632, immediately following the passage of the convective feature, a small area of light reflectivity was identified over the accident location. One AIRMET advisory active for mountain obscuration was active for the accident location for altitudes below 8,000 ft. No SIGMETS advisories were active for the accident location at the time of the accident. Several convective SIGMETS were active for the accident location at the accident time for thunderstorms moving into the area. Examination of the accident site by the National Transportation Safety Board (NTSB), investigator-in-charge, revealed that the airplane impacted terrain, near the top of a hill, at an elevation of about 3,101 ft mean sea level (msl). The hill was comprised of dark-brown-colored lava rocks and its approximate dimensions were about 650 ft long by 350 ft wide, with a peak elevation about 3,109 ft. The contour of the hill was orientated northeast/southwest. The desert floor to the southwest of the hill, from where the accident airplane approached, was about 40-50 ft lower than the hill elevation. The hill was about 3,000 ft northeast of the dry lake bed ridgeline. The first identified point of contact was an area of disturbed rocks and dirt near the top of the hill, which measured about 4 ft long, 3 ft wide, and 6 inches deep, and was located southeast of the main wreckage. Numerous small pieces of wreckage and paint transfer on the rocks were observed at the initial impact point, and all the major components of the airplane were located along the debris path, which was about 800 ft long and oriented on a heading about 030° magnetic, or with the main wreckage. Most of the debris consisted of small fragments of the airplane. The wings separated from the fuselage and large wing fragments were located on the northwest side of the hill about 200 ft from the initial impact point. The left aileron remained attached to an aft section of the wing. The right aileron was separated and located near the wing fragments. The fuselage and tail section came to rest upright about 400 ft from the initial impact point on a heading about 250° magnetic, and was leaning to the left. The engine separated from the fuselage and came to rest inverted about 400 ft past the main wreckage, where it struck and breached a wire fence. All the tubing and mounts were separated, and the bottom of the engine case was breached. The propeller blades were separated from the hub, and blade fragments were observed near the initial ground impact scars. The wreckage was recovered to a secure facility for further examination. Control continuity was established to all flight control surfaces. The engine was partially disassembled to confirm mechanical continuity of the internal mechanisms. Examination of the airframe and engine revealed no pre-impact anomalies that would have precluded normal operation; a complete report is contained within the public docket. 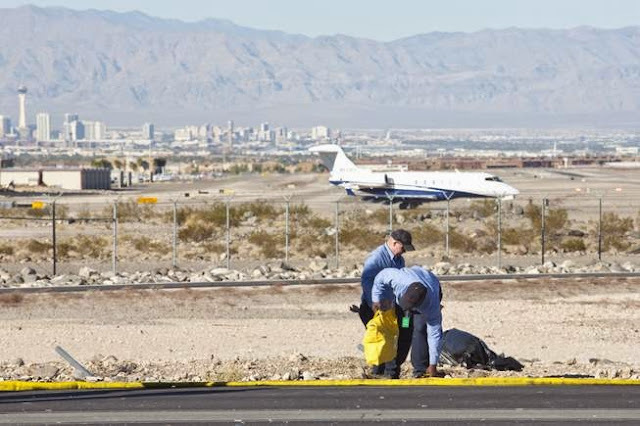 The Clark County Coroner's Office, Las Vegas, Nevada, conducted an autopsy of the pilot. The medical examiner determined that the cause of death was "blunt force injuries." The FAA Bioaeronautical Sciences Research Laboratory, Oklahoma City, Oklahoma, performed toxicological testing on the passenger and pilot. The results for the passenger were negative for carbon monoxide, volatiles, and tested-for drugs. Samples from the pilot were negative for carbon monoxide, and volatiles; however, drug testing identified 9.4 ng/ml of Tetrahydrocannabinol (THC) in the pilot's cavity blood; THC was also detected in the lung, liver, and brain. In addition, 10 ng/ml of tetrahydrocannabinol carboxylic acid (TCH-COOC) the active metabolite of THC, was identified in the cavity blood; it was also found in the lung, liver and brain. TCH is the primary active metabolite of marijuana and may impair mental and/or physical ability required for the performance of potentially hazardous tasks, such as flying, driving, and operating heavy machinery. THC is stored in fatty tissues and may leach out of those tissues back into blood after death; as a result, post mortem levels may be significantly higher than ante-mortem levels. Because blood that has leaked out of vessels and into cavities may be diluted with other fluids, there is no direct way to reliably compute antemortem blood levels of THC. THC is impairing and is typically used for its psychoactive properties; however, there is no direct relationship established between blood levels of THC and impairment. In discussion with other company pilots who have flown the airplane; check turns were used to clear for terrain directly in front and below the airplane during low-level flight. The company was founded in 2011. At the time of the accident, their operations were located at HND and at Gillespie Field Airport (SEE), San Diego/El Cajon, California. The company offered a variety of different flight options, including aerobatics and aerial dogfighting. The advanced profiles allowed for the customer to fly the maneuver. The air-to-air combat flights were operated as flight instruction. SCA's website, stated: "You fly the plane, you are at the controls and you execute the air-to-air combat tactics." It also stated, "Don't worry, you don't need any flight experience…Under the supervision of one of our expert combat fighter pilots, we teach you the art of basic fighter maneuvers, which will enable you to outmaneuver your opponent and get the kill." The operator used 4 EA-300 airplanes in the aerial combat profiles. The company had established a training syllabus that all its pilots were required to complete in order to conduct flights with customers. The syllabus included advanced aircraft handling, aerial dogfighting, and advanced air combat maneuvering. Each of the three sections ended with a check ride conducted by an authorized company flight instructor. The company required pilots to be in the building at least 30 minutes before the scheduled customer show time. Weather and NOTAMS were a required briefing item, and pilots were required to maintain VFR flight at all times. The SCA low-level standards stated that the customers would be briefed to not touch the flight controls during the low-level portion of their flight. Further, the pilots were instructed to maintain a minimum airspeed of 140 knots during low-level operation to ensure that maximum maneuverability was available to avoid obstructions. The minimum terrain clearance for the EA300 airplane was 30 ft agl. During low-level operation, all pilots were required to maintain a 1-mile separation from the airplane in front of them. Other SCA pilots who had flown the accident airplane reported that they performed "check turns" when conducting low-level operations to ensure clearance from terrain and/or obstructions directly in front of and below the airplane given the limited visibility from the rear seat. Check turns were a standard procedure taught in SCA. The check turns would consist of accomplishing a slight banked turn in each direction, in order to clear for that side of the airplane. SCA standards also stated that the pilots will continuously monitor the status and well-being of their customers and will relay the status of their customers to each other via the following codes: "Code 1" means "customer is good to go; continue profile." "Code 2" means the "customer is starting to feel poorly. Ease up on the profile, perhaps watch for a bit." Finally, "Code 3" means "the customer is vomiting or preparing to vomit; go to spectator mode." The standards contained no further guidance on the "spectator mode." According to the company website: "all SCA flights are instructional in nature conducted by certified flight instructors under 14 CFR Part 61 of the United States Code. Instruction will be provided during ground and flight portions for all flights." Organizations conducting flight training under 14 CFR Part 61, are not considered by the FAA to be certificated air agencies, and therefore are not subject to the same FAA oversight as certificated air agencies conducting training under the provisions of 14 CFR Part 141 (Pilot School) or Part 142 (Training Center). FAA surveillance of 14 CFR Part 61 flight schools is outlined in FAA Order 1800.56, National Flight Standards Work Program Guidelines. The only required inspection for flight schools operated under this part is for FAA inspectors to conduct one inspection for each Level 4 or 5 flight training device (FTD) located at each flight school and satellite school within the Certificate Holding District Office (CHDO) region. At the time of the accident, SCA did not utilize any Level 4 or 5 FTDs. A review of FAA Program Tracking and Recording Subsystem (PTRS) records revealed 9 records in the 3 years preceding the accident. Of the 9, four were complaint investigations, two were ramp inspections completed on the same day on different aircraft, one was an enforcement action, one was a near mid-air collision investigation, and one was the issuance of a waiver. According to the FAA, (legal interpretation to Doug McQueen, August 16, 2013): "In general, when a flight involves the carriage of person or property for compensation or hire, the operator must hold a part 119 air carrier or commercial operator certificate and operate such flights under part 121 or 135 rules." However, the letter points out certain exceptions in part 14 CFR 119 where operations may be operated without a 14 CFR part 119 certificate. 14 CFR Part 119.1 does not apply to several operations including student instruction, part 119.1(e)(1), and training flights, part 119.1(e)(3). Title 14 CFR 1.1, General Definitions section, does not define the term student instruction or training flights. The legal interpretation states "Because 'student instruction' existed as an exemption for several years before the Civil Aeronautics Board adopted the 'training flights' exception, the FAA interprets 'student instruction' broadly as referring to an operation in which a person receives flight training from an authorized instructor for the purpose of obtaining a certificate, privilege rating, or authorization under CFR part 61." Further, it states "The FAA interprets 'training flights' described in CFR 119.1(e)(3) as referring to operations in which a person receives training for the purpose of satisfying a training requirement outside of part 61, such as the crewmember training requirement of CFR 119.313. Therefore, flight crewmember training in special purpose operations such as crop dusting, seeding, spraying, and banner towing would fall under the 'training flights' exception of part 119(e)(3)." A legal interpretation from the FAA (See Legal Interpretation to William Grannis from Lorelei Peter, Assistant Chief Counsel for Regulations (August 3, 2017)) addresses operations attempting to use the flight training exemption of part 119(e). The letter states "Discovery flights, introductory flights, orientation flights, and demonstration flights are operations involving the carriage of persons for compensation or hire." Also, the letter states "In the hypothetical scenarios you presented in your letter, the persons being carried for compensation or hire are not interested in flight training. It is therefore unlikely that the purpose of these flights would be student instruction. Furthermore, because the flights you describe are introductory flights, it is unlikely that the persons would be receiving flight training for the purpose of satisfying a training requirement outside of part 61." On October 21, 2017, at 1611 Pacific daylight time, an Extra Flugzeugproduktions-Und EA 300/L, N414MT (Callsign Ace 5), collided with terrain within the watershed of the El Capitan Reservoir, near Four Corners, California. The flight instructor and passenger sustained fatal injuries and the airplane was destroyed. The airplane was registered to KD Leasing LLC., and operated by California Extreme Adventures LLC. (doing business as Sky Combat Ace), under the provisions of 14 Code of Federal Regulations Part 91. The local instructional flight departed Gillespie Field Airport, San Diego/El Cajon at 1557. Visual meteorological conditions prevailed, and no flight plan had been filed. The operator's website described itself as an "extreme aviation attraction," providing a series of aviation related "experiences", including aerobatics, air combat, and flight training. The passenger had signed up for the 25-minute-long, "Top Gun" experience, which according to their website was a flight which included, "Advanced Aerobatics", "Basic Aerobatics", a "Low Level Bombing Run", "You Fly Maneuvers", and "You Fly Departure". Preliminary radar data provided by the FAA indicated a target initiating a climbing left turn after departing from runway 17, and reaching a mode C reported altitude of about 4,700 ft mean sea level (msl), 5 miles northeast of the airport. For the next 10 minutes, the target followed a track along the general path of the San Diego River, then east of the El Capitan Reservoir, and north towards the town of Four Corners. The track followed a meandering path at varying airspeeds and altitudes ranging between 4,500 and 7,100 ft in a manner consistent with aerobatic maneuvers, and multiple witnesses along the route indicated seeing an airplane performing aerobatic-like maneuvers about that time. At 1610 the target had reached its farthest point from the airport, just north of the reservoir. It then began to track back to the southwest, climbing from 5,000 ft to 6,900 ft over the next 90 seconds. About 15 seconds later, the last target was recorded just to the southeast at an altitude of 4,500 ft. The accident site was located within the river valley, on a hillside slope at an elevation of about 775 ft, about 1,000 ft east of the last radar target. The primary wreckage consisted of a 4-ft-deep by 6-ft-wide crater which contained fragmented engine and airframe components. The outboard left wingtip rib, along with shards of the red position lamp were located about 14 ft west, with the corresponding right wingtip rib and green position lamp shards about the same distance to the east. The debris field continued about 75 ft downhill to the north, and contained the engine crankcase, instrument panel components, fragmented tubular airframe material, the crumpled tubular steel remains of the tail section, and burnt composite structure. Most of the airplane's structure was consumed by fire, except for the right rear section of the canopy frame and about a dozen composite skin fragments which were interspersed in the surrounding trees and immediate vicinity of the impact site. The impact ignited a brushfire, which burnt about 45 acres of land northeast of the accident site along the flank of the adjacent hillside. A secondary debris field was located in the dry river bed about 400 ft north of the crater. The debris was oriented east-west, about 800 ft long, and contained the left (lock side) and rear sections of the canopy frame, multiple pieces of canopy plexiglass material, and a fragmented headset. Neither the debris field, nor the canopy components displayed any indications of fire. The two people killed in a plane crash near El Capitan Reservoir on Saturday were on a paid flight experience from a company that offers adrenaline-fueled rides for adventure seekers. 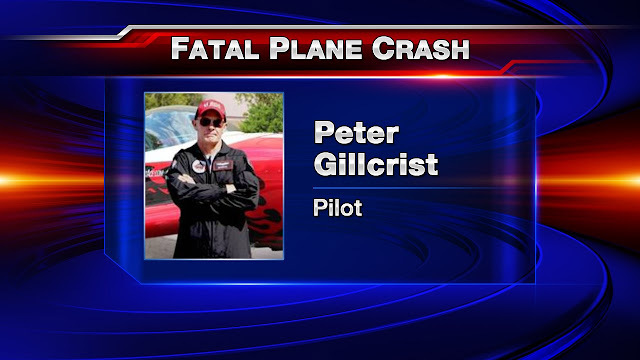 A spokeswoman for Sky Combat Ace identified the victims as Peter Gillcrist, one of the company’s pilots, and Garrett Engler. The EXTRA EA 300 plane took off from Gillespie Field about 3:50 p.m. When it failed to return, Sky Combat Ace employees notified air traffic control. Sheriff’s and California Highway Patrol officials said 911 callers in the Lakeside area reported a possible crash east of El Monte Road about 4:20 p.m. The impact sparked a fire that charred 20 acres. Debris from the crash was located about an hour later. “To our knowledge, there were no distress calls made prior to the accident,” Fazio said. 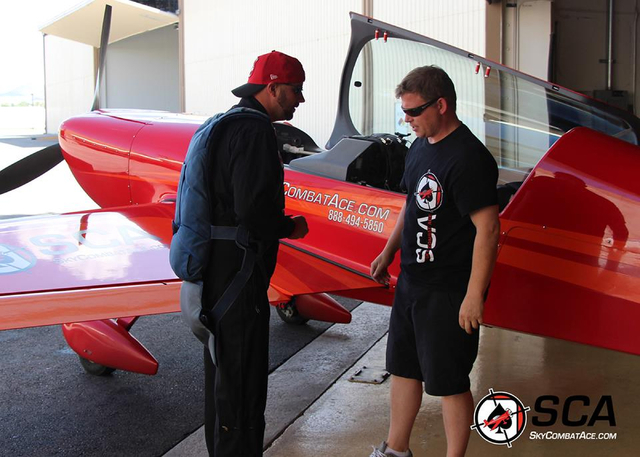 Sky Combat Ace, which operates out of Las Vegas and San Diego, sells a variety of flight packages that include aerobatic and simulated “air combat” experiences. “You’re not just a passenger on a joy ride. You are a steely-eyed fighter pilot at the controls of your very own ‘fighter jet,’ pulling Gs and squeezing the trigger to ‘get the kill,’ ” the company’s website reads. It’s unclear which experience Engler had purchased or who was flying the plane at the time. Some flight packages allow the student to control the aircraft. The aircraft, which was built in 2009, had up-to-date certification and was categorized for normal and acrobatic flights, federal records show. 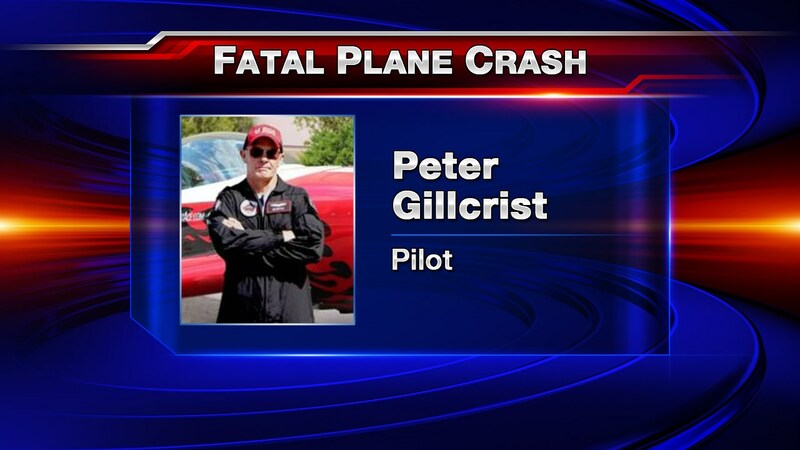 Gillcrist is the chief pilot for Sky Combat Ace’s San Diego location, according to the company’s website. After graduating from the University of Virginia, he worked at Lockheed Martin with the Skunk Works, an experimental engineering group that develops aircraft and associated technologies. He later taught competitive aerobatics, emergency maneuver training and spin training. A similar fatal crash involving the same company occurred in April 2016. In that incident, a student passenger and an instructor pilot were performing “air combat” maneuvers when they crashed near Las Vegas. Fazio said the passenger had paid for the “Sky Combat” experience offered by the company, and that the crash happened as they were returning to the hangar. The “Sky Combat” package allows the participant to fly the plane while the pilot teaches “air-to-air combat” techniques. It’s unclear who had control of the aircraft when it crashed, Fazio said at the time. The National Transportation Safety Board is continuing to investigate Saturday’s crash. A pilot and his passenger died when a small plane crashed near the El Capitan Reservoir Saturday afternoon, according to a spokesperson for the pilot's employer. The victims were identified Monday as pilot Peter Gillcrist and passenger Garrett Engler, according to Sky Combat Ace spokesperson Megan Fazio. The men died after their plane crashed around 4:15 p.m. Saturday, sparking a 20-acre brush fire. The National Transportation Safety Board identified the wreckage as a Extra EA 300/L. Fazio said the plane was registered to KD Leasing and operated by California Extreme Adventures. Sky Combat Ace operates out of Henderson, Nevada, but has a location out of Gillespie Field, which is where the plane was headed Saturday. "To our knowledge, there were no distress calls made prior to the accident," Fazio said. The wreckage is in a remote area near the El Capitan Reservoir and was not accessible to ground crews Saturday. Gillcrist, known as "Bandito" in the air, taught competitive aerobatics, emergency maneuver training, and spin training, according to the company. His mother was an aviation physiologist, his father was a Navy pilot and his wife is a pilot for Southwest Airlines. The NTSB and Federal Aviation Administration have now taken over the investigation with the NTSB in the lead. Sky Combat Ace locations are closed until further notice, Fazio said. "We are devastated and extend our heartfelt sympathy to the families and to our SCA team members who have lost a beloved colleague and pilot," she said in a written statement. SAN DIEGO (NEWS 8) — New information emerged Sunday about a plane crash that sparked a brush fire in the East County. 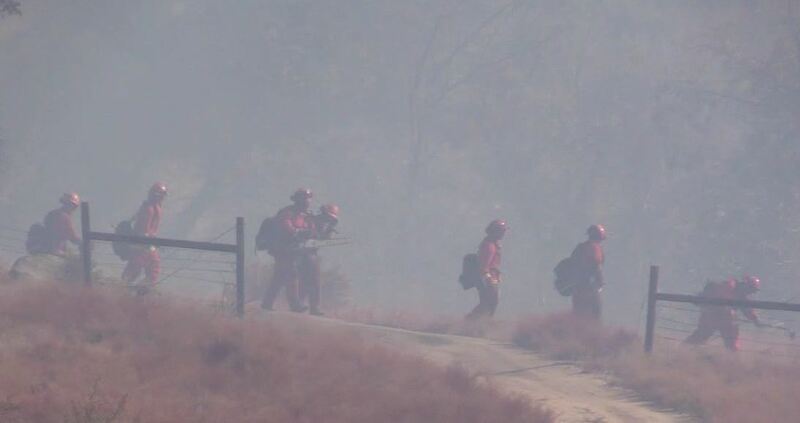 It happened around 4:15 p.m. on Saturday near the El Capitan Reservoir in Lakeside. But the crash site was difficult for crews to access. Firefighters brought in heavy equipment Sunday to access the wreckage of the Extra EA-300 plane. A spokesperson for the US Forestry Service called the crash "unsurvivable." 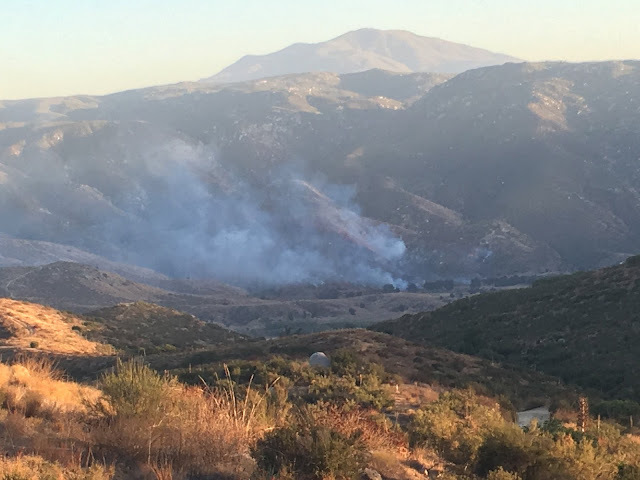 The fire sparked by the crash burned 15 to 20 acres and it took several hours to get under control through a series of aerial drops and ground efforts. By Sunday, lines of retardant marked the hillside. An investigator with the NTSB arrived on scene Sunday to start the process of figuring out what went wrong. Federal records show the plane's tail number, given to News 8 by the NTSB, is registered to KD Leasing in Henderson, Nevada. It appears frequently on the website of Sky Combat Ace, a company that operates out of the Las Vegas area and Gillespie Field, offering thrill seekers the chance to ride as a passenger or even perform their own aerobatic stunts from the pilot's seat. There are several videos online showing this same plane in action over Las Vegas and the East County. Residents say they often see pilots performing stunts near the reservoir. So far investigators aren't saying how many people were on board, but the manufacturer says the plane is typically equipped with two seats. 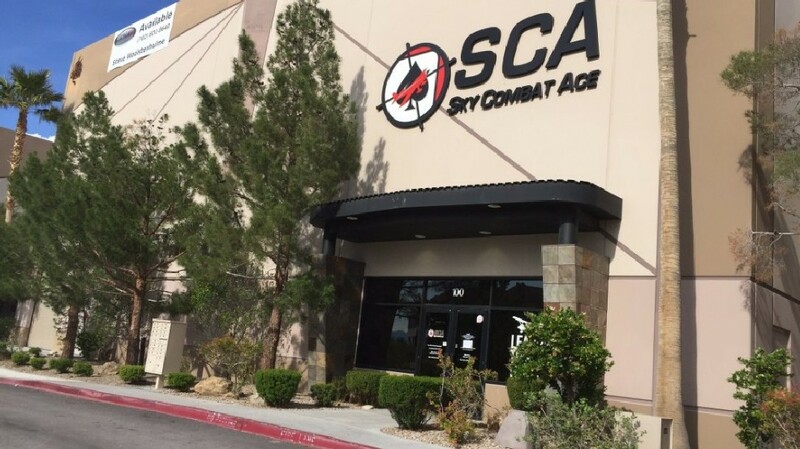 News 8 reached out to Sky Combat Ace's headquarters in Las Vegas, but no one answered the phone. On its website, the company says "safety has always been the #1 priority at SCA." LAKESIDE (CNS) - Firefighters put out a small fire north of the El Capitan Reservoir in Lakeside and sheriff's deputies were securing the scene where a small plane crashed, authorities said Sunday. The fire was first reported at 4:18 p.m. Saturday as the result of a possible plane crash, according to the California Highway Patrol. The blaze was estimated at 20 acres by nightfall with its forward progress stopped, sheriff's officials said. The flames were out and deputies were securing the scene until officials from the National Transportation Safety Board arrive to begin their investigation, sheriff's officials said. The Federal Aviation Administration reported an EXTRA EA 300 plane with two people on board was missing after taking off from Gillespie Field in El Cajon, according to the San Diego Union Tribune. There was an aircraft accident Saturday at the North end of the El Capitan reservoir. The aircraft registration and type is unknown at this time. The number of people onboard also cannot be confirmed at this time. The FAA and the NTSB will investigate. A small plane crashed at the base of a remote hill near El Capitan Reservoir Saturday, presumably killing those onboard as no survivors were found, authorities said. The crash sparked a brush fire that had grown to about 20 acres shortly after nightfall. Officials were not able to confirm what aircraft was down, but a Federal Aviation Administration spokesman said the agency got a report of an EXTRA EA 300 plane with two people onboard missing from a local flight from Gillespie Field in El Cajon. Sheriff’s and California Highway Patrol officials said 911 callers in the Lakeside area reported the possible crash east of El Monte Road about 4:20 p.m. Some callers said they didn’t see the crash, but heard what they thought was an impact, then saw a fire. Deputies headed that way and a sheriff’s helicopter scanned the area, finding the fire but no confirmation of a plane crash, sheriff’s Lt. Mario Zermeno said. Authorities said they couldn’t get close to verify the possible wreckage while air crews were dropping retardant and water on the fire. It was about 7 p.m. before the debris was confirmed that of a plane, with few parts identifiable. About 5:20 p.m., a Cal Fire air tanker crew working on the blaze reported seeing some type of debris in the area, Zermeno said. U.S. Forest Service fire crews worked the blaze on the ground, as it was within the boundaries of the Cleveland National Forest east of the reservoir. The area is known as Four Corners. The fire burned about 20 acres, forest service spokeswoman Wende Cornelius said. Footage from News 8 showed the smokey fire at the base of steep, rugged hills, with air tankers and helicopters dropping water and fire retardant on the flames while it was still daylight. According to Wikipedia, an EXTRA EA 300 is an aerobatic plane, usually a two-seater, built by Extra Flugzeugbau. SAN DIEGO -- A plane crashed near the El Capitan Reservoir in Lakeside Saturday afternoon, sparking a brush fire. 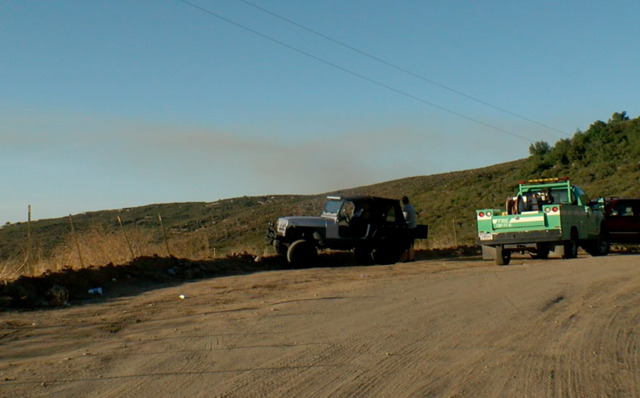 The crash happened sometime after 4 p.m., according to Wende Cornelius, a spokesperson for Cleveland National Forest. Cornelius described the crash as "non-survivable." Officials have not confirmed the type of aircraft that went down or how many people were onboard, but Allen Kenitzer, a Federal Aviation Administration spokesperson, said an EXTRA EA300 plane with two people onboard was reported missing from a local flight from Gillespie Field in El Cajon around 6:30 p.m. The blaze, estimated to be 45 acres, was northeast of the reservoir. No homes or structures were threatened by the fire. Crews from Cal Fire, the San Diego Fire-Rescue Department and the Barona Fire Department were assisting the Cleveland National Forest in responding to the blaze. A small plane has crashed into a hillside just east of the El Capitan Reservoir. A Cleveland National Park spokesperson says the crash started a brush fire that had burned 30 acres by 8 p.m. Ground fire crews are working to reach the site but they say it is very isolated. Air tankers and helicopters are attacking the blaze from the air. Authorities working on the crash include Cleveland National Fire, Calfire and two strike teams from San Diego Fire. Allen Kenitzer, a spokesperson for the FAA told 10News "the aircraft registration and type is unknown at this time. The number of people onboard also cannot be confirmed at this time." He said the plane may have been flying from Gillespie Field in El Cajon, but all information was preliminary. The FAA and NTSB are investigating. Aircraft crashed under unknown circumstances. The two (2) souls on board were fatally injured. Wreckage located near El Capitan Reservoir. The commercial pilot reported that, while at 3,000 ft above ground level and on a long final to the runway, he advanced the propeller condition lever to full forward and that he then felt a loss of engine power. He checked that the mixture was full rich and that he had the center fuel tank selected. The propeller continued to windmill while he unsuccessfully attempted to restart the engine twice. He decided not to feather the propeller. The pilot realized that the airplane was not going to reach the runway and made a sudden left turn in an attempt to land on a road that paralleled the airport fence line. During the off-field landing, the right wing and landing gear sustained structural damage. Examination of the airplane revealed that fuel was present in the center and left wing fuel tanks but that the right wing fuel tank was empty. Examination of the propeller governor, engine, and airframe revealed no anomalies that would have precluded normal operation. A sound spectrum study of audio recorded by a GoPro camera onboard the airplane verified that, about 1 minute before the accident, the engine rpm began fluctuating and that it then steadily dropped off to about half the normal engine operating rpm by the time of impact. A partial loss of engine power during cruise flight for reasons that could not be determined because postaccident examination of the engine did not reveal any anomalies that would have precluded normal operation. On November 5, 2014, at 1145 Pacific standard time, an Extra Flugzeugproducktions-UND, EA-300/L, N369XT, experienced a loss of engine power while on final approach to runway 35L, Henderson Executive Airport, Las Vegas, Nevada, and collided with terrain short of the runway. The airplane's right wing was substantially damaged; the commercial pilot and single passenger were uninjured. The airplane was registered to Unmanned Systems, Inc., and operated by Sky Combat Ace as a 14 Code of Federal Regulations Part 91 instructional flight . Visual meteorological conditions prevailed for the flight, which originated from Henderson Executive Airport at 1100. The pilot stated that while on long final to runway 35L, and was about 3,000 feet above ground level (agl) when he advanced the propeller condition lever to full forward. He then felt a loss of engine power. He checked that the mixture was full rich, and that he had the acro tank (center fuel tank) selected. The propeller continued to windmill while he attempted to restart the engine twice unsuccessfully. He did not feather the propeller. The pilot realized that he was not going to make the runway, and made a sudden left turn in an attempt to land on a road that parallels the airport fence line. The right wing and landing gear sustained structural damage during the off field landing. The pilot stated that the center fuel tank was 3/4 full (17 gal capacity), and the wing tanks were empty. A Federal Aviation Administration (FAA) Inspector examined the airplane at the scene of the accident and reported that the right wing fuel tank was empty, the left wing fuel tank had about 2 inches of fuel in it, the center acro tank had about 14 inches of fuel, and the fuel selector was in the OFF position. On November 7, 2014, a FAA inspector examined the engine and the attached propeller governor. The inspector found that the propeller control linkage was connected and functioned properly, positive rotation between the governor drive spline and the engine was verified, and positive oil flow was observed within the propeller governor oil ports. On November 6, 2015, an NTSB investigator examined the airplane and engine. No preaccident anomalies with the engine, engine controls, or fuel system were identified. The accident was captured on a GoPro camera that was mounted in the cockpit of the airplane and faced aft, viewing the occupants. The NTSB Vehicle Recorders Division performed a Sound Spectrum Study on the audio portion of the recording. The study stated that the strongest tone was steady while in cruise flight, which equates to engine speed of 2,360 rpm. About 1 minute before terrain impact the blade passage frequency oscillated over the next 12 seconds, and then the engine rpm steadily decreased to 1,205 at the time of terrain impact. On November 5, 2014, at 1145 Pacific standard time, an Extra Flugzeugproducktions-UND, EA-300/L, N369XT, experienced a partial loss of engine power while on final approach to runway 35L, Henderson Executive Airport, Las Vegas, Nevada, and collided with terrain short of the runway. The airplane's right wing was substantially damaged; the commercial pilot and single passenger were uninjured. The airplane was registered to Unmanned Systems, Inc., and operated by Sky Combat Ace under the provisions of 14 Code of Federal Regulations, Part 135. Visual meteorological conditions prevailed for the flight, which originated from Henderson Executive Airport at 1100. The flight instructor was conducting an aerobatic demonstration flight for a pilot-rated passenger, during which the flight instructor was demonstrating the airplane’s characteristics to the pilot. The flight instructor reported that he performed a spin maneuver, and during the recovery, he felt the tension in the rudder pedal become completely slack. The pedal moved completely forward, and he realized that the rudder cable must have separated. During the subsequent emergency landing at a nearby airport, the flight instructor could not maintain directional control, and the airplane slid off the right side of the runway. A postaccident examination of the airplane revealed that the rudder cable had separated. The rudder cable showed signatures indicative of a failure due to tension overstress. Several of the wire strands on the cable were damaged by rubbing wear and were either completely worn through or nearly worn through, compromising the cross-section of the cable. The Federal Aviation Administration had issued a special airworthiness information bulletin (SAIB) for this airplane about 3 years before the accident to address similar rudder cable failures. The SAIB recommended that, to mitigate risk, cable inspections should be completed and a protective hose should be installed. A review of the maintenance logbooks found no record indicating that the SAIB had been implemented, and no protective hose was found. The SAIB was not mandatory, and the operator, which operated flights for paying passengers, including aerobatics and air combat demonstrations, chose not to the comply with it. If the operator had chosen to comply with the SAIB, the rudder cable may not have failed. The failure of the rudder cable due to tension overstress as a result of the cable’s strength being compromised by wear damage, which resulted in the flight instructor’s inability to maintain directional control during the landing roll. On October 26, 2014, about 1130 Pacific daylight time, an Extra Flugzeugproduktions, N763DT, experienced an in-flight rudder cable separation after recovering from an aerodynamic maneuver, and veered off the runway during the emergency landing at Mc Carran International Airport, Las Vegas, Nevada. Sky Combat Ace was operating the airplane under the provisions of 14 Code of Federal Regulations (CFR) Part 91. The flight instructor and pilot-rated passenger were not injured; the airplane sustained substantial damage. 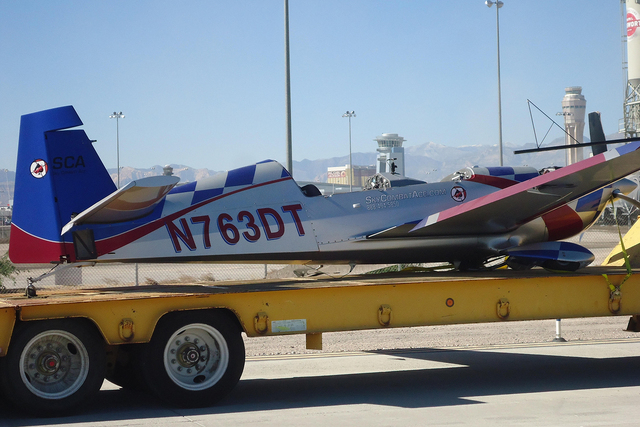 The aerobatic demonstration flight departed from the Henderson Executive Airport, Las Vegas about 1100. Visual meteorological conditions prevailed, and no flight plan was filed. The flight instructor stated that the purpose of the flight was to take the passenger on an aerobatic introduction flight where he would demonstrate the characteristics of the airplane. He performed a spin maneuver, and during the recovery, he felt the tension in the rudder pedal become completely slack. The pedal moved completely forward, and he realized that the rudder cable must have separated. The flight instructor declared an emergency, and decided to land at Mc Carran International Airport due to their robust emergency facilities and less of a crosswind. The flight instructor further stated that during landing on runway 19R, he could not maintain directional control, and the airplane slid off the right side. A post accident examination of the airplane was performed by an inspector from the Federal Aviation Administration (FAA). He found the area that the rudder cable had separated, and it was sent to the National Transportation Safety Board (NTSB) Materials Laboratory for further evaluation. The examination revealed that the rudder cable showed signatures indicative of a failure as a result of tension overstress. Several of the wire strands on the cable were damaged by rubbing wear. Several of the damaged strands were either completely worn through or nearly worn through, compromising the cross-section of the cable. There was no obvious indication of material transfer. A Special Airworthiness Information Bulletin (SAIB), CE-12-01 was issued in October 2011 to address some Extra Aircraft rudder cable failures. The SAIB stated that because the cables are made of stainless steel they are susceptible to corrosion and wear damage. The recommendation to mitigate risk was for cable inspections to be completed, and to install a protective hose on the cable. There was no record of implementation of this SAIB in the logbooks. On April 30, 2016, about 1630 Pacific daylight time, an Extra Flugzeugproduktions UND, EA-300/L, N330MT, sustained substantial damage when it impacted mountainous terrain about 12 miles south of Henderson Executive Airport (HND), Las Vegas, Nevada. The airplane was registered to and operated by Vegas Extreme Adventures LLC under the provisions of Title 14 Code of Federal Regulations (CFR) Part 91. The airline transport pilot and passenger were fatally injured. Visual (VMC) meteorological conditions prevailed, and no flight plan had been filed. The local business flight departed HND about 1600. Information provided by the company representatives revealed that the accident airplane departed and rendezvoused with two other company airplanes to conduct a simulated air to air combat mission. Two airplanes at a time would maneuver against each other, while the other airplane observed from a safe distance. Following completion of their air combat profile, all three airplanes returned towards HND. The first two airplanes landed and realized that the third airplane behind them did not return. Subsequently, the company launched an airplane to conduct a search, and shortly thereafter, the wreckage was discovered near a hilltop. Examination of the accident site by the National Transportation Safety Board, investigator-in-charge, revealed that the airplane impacted mountainous terrain on a 030 degree heading. All the major components of the airplane were located throughout the 800 foot long debris path. The pilot stated that while on long final to runway 35L, about 3,000 feet above ground level (agl), he felt a loss of engine power. The propeller continued to windmill while he attempted to restart the engine twice unsuccessfully. He then executed a forced landing to flat desert terrain short of runway 35L. The right wing and landing gear sustained structural damage during the off field landing. The pilot stated that the center fuel tank was 3/4 full (17 gal capacity), and the wing tanks were empty. 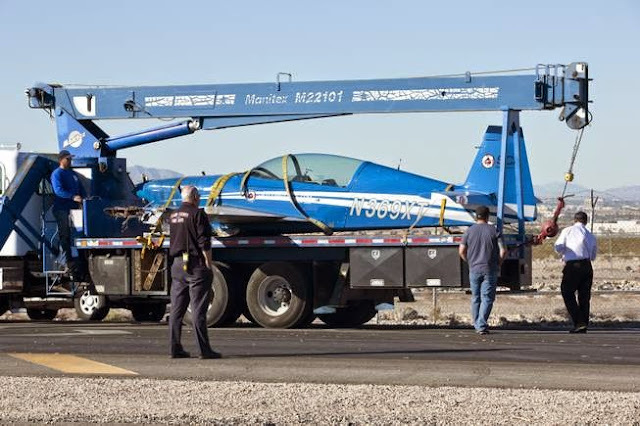 The Sky Combat Ace stunt plane that crashed April 30 near Jean impacted a hilltop 12 miles south of Henderson Executive Airport, killing the pilot and his passenger and spreading debris for 800 feet, federal investigators said in a preliminary report Wednesday. The single-engine aircraft, an Extra EA-300/L registered to Vegas Extreme Adventures LLC, impacted mountainous terrain while heading northeast, according to the National Transportation Safety Board, investigator-in-charge. The preliminary report did not mention a probable cause for the crash but said visual flight conditions prevailed and no flight plan had been filed. A factual report followed by an analysis and probable cause is expected to take eight months to a year to complete. Pilot Ben Soyars, 37, of Las Vegas and Steve Peterson, 32, of Rohnert Park, California, died in the crash of blunt trauma injuries, the Clark County coroner’s office has said. 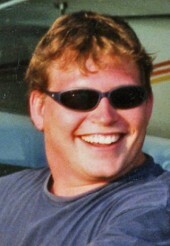 Peterson was among 12 men who had traveled to Las Vegas for a bachelor party and had planned to take simulated, air-to-air combat flights on Sky Combat Ace planes with an “instructor” pilot in the back seat of each of the three aircraft and their “student” passengers in the front seat of each cockpit. But with thunderstorms lurking near Henderson Executive Airport about 4 p.m. on April 30, members of the bachelor party had questioned the Sky Combat Ace refund policy. It says essentially that customers must go on the flights with the company’s instructor pilots or forfeit their fare money. So rather than lose more than $8,000 that the group had ponied up for the flights, three of nine who had planned to go departed in three of the company’s planes about 4:30 p.m.
After the simulated air-combat maneuvers, all three aircraft returned toward the Henderson airport. But after the first two airplanes landed “and realized that the third airplane behind them did not return … the company launched an airplane to conduct a search,” the report reads. The wreckage was discovered a short time later near a hilltop. All major components of the airplane were located in the debris path, according to the preliminary investigation report. Sky Combat Ace President Richard Coe has not returned phone calls to the Las Vegas Review-Journal seeking comment. Steven Anthony "Scuba" Peterson, of Rohnert Park passed away on April 30, 2016 at the age of 32. Steve was born on October 5, 1983 in Santa Rosa, CA to Robert and Jackie Peterson, and was a lifelong resident of Sonoma County. 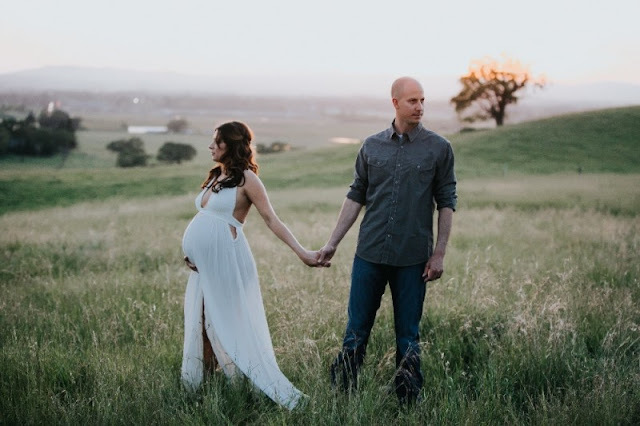 Steve grew up in Rohnert Park and graduated from Rancho Cotati High School in 2002. It was in high school that Steve developed a passion for working with his hands and tools on engines. He made a career for himself at Peterson CAT where he went through extensive schooling and training to become a certified Electric Power Generation Technician, in which he worked on large diesel engines and generators; often times keeping hospitals powered during emergencies, and being called upon 24 hours a days seven days a week in response to urgent situations requiring his expertise. Steve's strong work ethic and his positive attitude during challenging times were admired by all those around him. Steve was a genuine friend, loving brother and son, and devoted husband who always made family and friends his top priority. Many looked to Steve and depended on him for support and guidance in all aspects of life. He was extremely passionate about the outdoors, and enjoyed hunting, fishing, and diving in his spare time. He made a point of living every moment to its fullest. Steve is survived by his wife, Jennifer Leah, their unborn daughter Avery Rose, his parents Robert and Jackie, his older brother Mike, his twin brother Chris, and twin sisters Christine and Jennifer. Steve's spirit brought so much love, joy, and laughter to all those he encountered. He will forever be remembered and greatly missed by all that knew him. A memorial service will be held at Pleasant Hill Memorial Park, 1700 Pleasant Hill Rd., Sebastopol, CA 95472 at 11:00 a.m., Saturday May 7, 2016. Benjamin Anderson Soyars, III, "Ben", age 37, died on Saturday, April 30th, 2016 while living in Nevada. He was the son of Benjamin A. Soyars, Jr. and Ellen H. Soyars; brother of Lindsay Soyars Ward & her husband, Casey; and uncle of Catherine Finley Ward. He also leaves behind his long-time love, Charity Elam and her daughter Wynnter of Richmond. Ben grew up in Warrenton and attended Highland School before leaving for prep school and college. He then moved to Arizona to attend flight school. Ever since boyhood, Ben had a passion for flying. He was a highly accomplished pilot and instructor logging over 9, 000 hours in various types of planes, from small aerobatic aircraft to corporate jets. He will be remembered by many for his bright smile, his quick wit, and his engaging personality. A memorial gathering will be held at the Airlie Conference Center Smokehouse, 6809 Airlie Rd., Warrenton, VA 20187 on Saturday, May 21st, 2016 from 1 to 4 pm, where family and friends are invited to share stories, pictures and memories of times spent together with Ben. 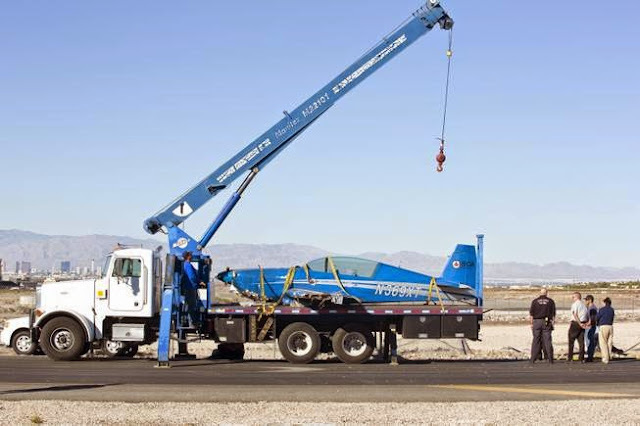 A Sky Combat Ace stunt plane sits on truck bed after its pilot made an emergency landing Oct. 26, 2014 at McCarran International Airport with a passenger on board. National Transportation Safety Board investigators determined that the pilot experienced a control issue with the aircraft during spin maneuver when a rudder cable failed. 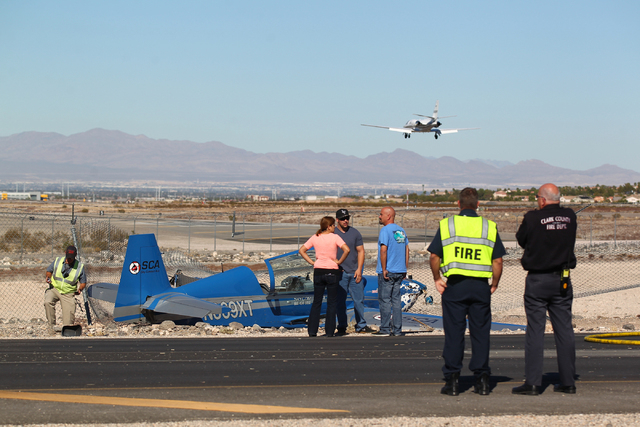 Officials from the Clark County Department of Aviation, Clark County Fire Department, Henderson Fire Department, and Henderson Police Department respond to an airplane crash at the southern edge of the Henderson Executive Airport in Henderson on Wednesday, Nov. 5, 2014. The same stunt plane that crashed Saturday, killing a Sky Combat Ace pilot and his passenger, had been involved in a dangerous, low-flying maneuver in 2015 over the Colorado River south of Hoover Dam, according to Federal Aviation Administration officials. A pending enforcement action letter, obtained by the Las Vegas Review-Journal through a Freedom of Information Act request, proposes to suspend the commercial pilot and flight instructor certificates of Denis Richard Boissonneault of Las Vegas for 135 days for violating FAA regulations during a March 16, 2015, flight from Henderson Executive Airport. “On takeoff … you abruptly pitched up the aircraft in a manner not normal for takeoff of an Extra,” the letter reads, referring to the Extra EA300 aircraft with tail No. N330MT. An FAA official familiar with the incident said Thursday the FAA was alerted to the low, aerobatic flight by Bureau of Reclamation police at Hoover Dam who saw the plane flying south of the dam. The FAA official said Boissonneault had a passenger in the plane and that such maneuvers below 1,500 feet above the surface are prohibited by FAA regulations. “Your operation of N330MT, in the manner and circumstances … was careless or reckless so as to endanger the life or property of another,” reads the Sept. 9, 2015, letter to Boissonneault. Attempts to reach Boissonneault on Thursday were unsuccessful. Messages seeking comment from Sky Combat Ace President Richard “Tex” Coe left on the company’s answering machine also were not returned. 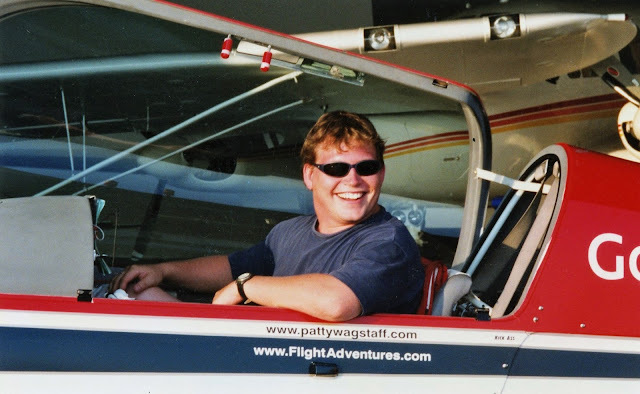 FAA officials confirmed that the two-seat, single-engine aircraft Boissonneault flew south of Hoover Dam on March 16, 2015, is the same one that crashed Saturday near Jean killing a passenger, Steve Peterson, 32, of Rohnert Park, California, and Sky Combat Ace instructor pilot Ben Soyars, 37, of Las Vegas. Peterson and his twin brother, Chris Peterson, were among 12 friends who had traveled to Las Vegas for a bachelor party. Nine from the group were supposed to fly in at least three Sky Combat Ace stunt planes as part of a simulated air-combat and bombing run experience they had planned months in advance through Vegas Extreme Adventures. With thunderstorms in the area, some members of the group declined to go on the flights. But Steve Peterson and two others decided to go to avoid forfeiting the more than $8,000 in fares in keeping with the company’s non-refund policy, one member of the group has said. The FAA and the National Transportation Safety Board are investigating Saturday’s fatal stunt plane accident near Jean. The FAA is also investigating Sky Combat Ace on legal grounds to see if the company was in compliance with its regulations at the time of Saturday’s accident. Records obtained by the Review-Journal, however, show there have been two close-call incidents in which pilots and passengers narrowly escaped injuries. And, there have been numerous complaints about Sky Combat Ace’s flights over Henderson neighborhoods and elsewhere in Southern Nevada filed with local authorities and the FAA. 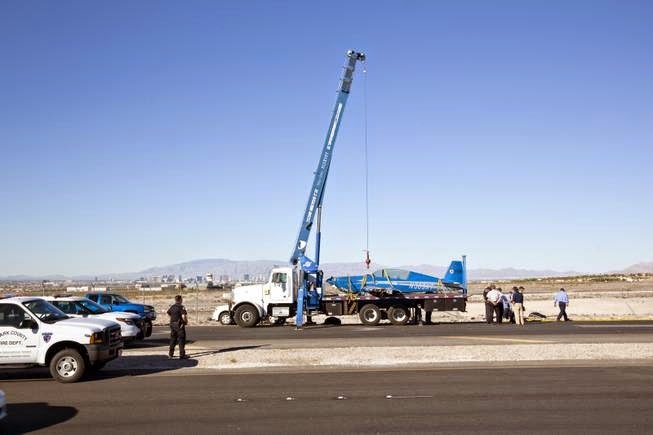 On Oct. 26, 2014, a Sky Combat Ace stunt plane made an emergency landing at McCarran International Airport with a passenger on board after performing an aerobatic spin maneuver. National Transportation Safety Board investigators determined that the pilot’s control problem stemmed from a rudder cable that had failed. The next month, a Sky Combat Ace aircraft was forced to land on a street near the Henderson airport after the pilot experienced a partial loss of engine power. The accident caused substantial damage to the plane’s right wing. FAA spokesman Ian Gregor said Sky Combat Ace had been granted a waiver in 2011 to carry passengers for hire while flying in formation but the waiver was suspended for a month in 2012 after the agency investigated a complaint that the company’s aircraft flew in formation at 500 feet above ground level contrary to provisions of the waiver. The waiver was revoked Aug. 30, 2012, “based on a second complaint involving low-flying aircraft near the Hoover Dam,” Gregor said. Las Vegas trial lawyer Robert W. Cottle said Thursday he is representing a mechanic in a claim against Sky Combat Ace. He said his client was run over in January by a Sky Combat Ace plane that was taxiing at the south end of the Henderson Airport. “Fortunately he’s alive,” Cottle said about the mechanic who works for an air service company at the airport. “He turned around to catch the red plane in the corner of his eye. That’s when the plane ran over the top of him and his foot was struck by the wheel,” he said, adding that the mechanic remained flat on the tarmac to avoid being struck by the propeller. LAS VEGAS - The two men killed when a stunt plane crashed near Las Vegas were performing “air combat” maneuvers as part of a paid flight experience provided by a tourism company catering to extreme adventure-seekers. Benjamin Anderson Soyars of Las Vegas, and Steve Anthony Peterson of Rohnert Park, California, died Saturday of blunt force injuries, according to the Clark County Coroner’s office. Their deaths have been ruled an accident. The company, Sky Combat Ace, on its website describes Soyars, 37, as a veteran pilot with a background in competition and airshow flying. The company allows customers to fly stunt planes with instructors’ supervision. The company didn’t identify the two men by name but said it was a student passenger and an instructor pilot. It’s unclear who was flying the plane at the time of the crash. The company said it has been providing instructional aerobatic airplane rides since 2011 and has had 15,000 incident-free flights in the past five years. Fazio said the passenger paid for and had performed the “Sky Combat” experience and that the accident happened as they were returning to the hangar. The website indicates the tour package allows the student to fly the plane while the instructor teaches “the art of aerial dogfighting.” No other planes were involved. The parent company, Vegas Extreme Adventures LLC, said in a statement that the fixed-wing single-engine plane took off from Henderson Executive Airport at 4 p.m. Saturday but didn’t return from its outing on time. They learned of the crash about 4:45 p.m., after calling air traffic control to report the missing Extra 300 airplane. No distress calls were made before the crash. The Federal Aviation Administration said it’s investigating. Records show the aircraft’s airworthiness was classified standard and categorized for normal and acrobatic flights. It was built in 2011 and had up to date certification. The National Transportation Safety Board was also called to investigate but couldn’t immediately provide details. CLARK COUNTY (KTNV) - A man from California was one of two people killed in a plane crash in rural Clark County Saturday evening. 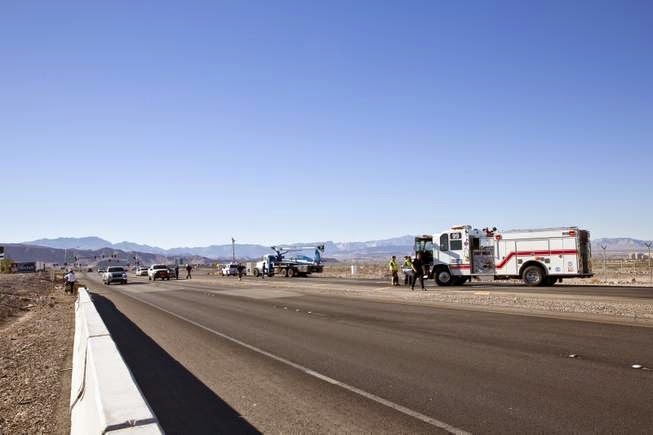 The incident happened several miles east of I-15 near Jean, near State Route 604 and Southern Nevada Liteweight Road. The plane is a Extra EA-330LC. 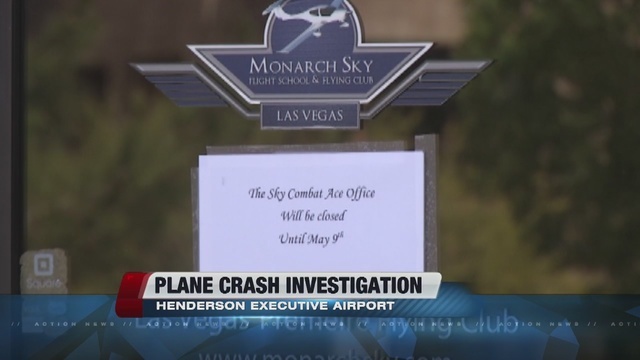 Records indicate the plane belonged to a Henderson company called Vegas Extreme Adventures, also known as Sky Combat Ace. The business offers customers acrobatic stunt rides. 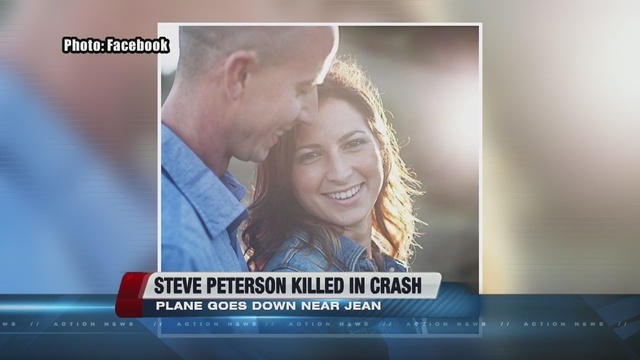 One of the plane's occupants was identified as 32-year-old Steve Peterson of Rohnert Park, Calif. 13 Action News learned Peterson leaves behind a pregnant wife who's expecting a baby in June. A student pilot at the facility said this was a shocking tragedy. "My heart just sank," said Dan Koury. "Right away it was just like oh my God, it's a tragedy for anyone to die in a plane crash but somehow it hits closer to home when you know the people who are out there. It's just a really sick feeling to my stomach." According to a statement from Vegas Extreme Adventures, the plane took off from Henderson Executive Airport around 4 p.m. When the aircraft failed to return on time, employees notified air traffic control of the missing airplane and immediately launched an aircraft for search and rescue operations. At approximately 4:45 p.m., the crash site was located and called in to the Henderson Executive Airport Control Tower, who in turn notified emergency personnel of the location of the crash near the Jean dry lakebed. There was 1 student passenger and 1 instructor pilot onboard the plane. When emergency responders arrived, both occupants were pronounced dead at the scene. To Vegas Extreme Adventures' knowledge, there were no distress calls made prior to the accident. "On behalf of all Vegas Extreme Adventures employees and staff, we would like to express our deepest condolences to the families who have lost loved ones and have been affected by this unfortunate accident," according to the statement. "Vegas Extreme Adventures is working closely and cooperating with the FAA and the National Transportation Safety Board to determine the cause of the accident." According to the statement, Vegas Extreme Adventures has been providing instructional aerobatic airplane rides to the general public since 2011 and has conducted more than 15,000 incident-free flights over the last 5 years. 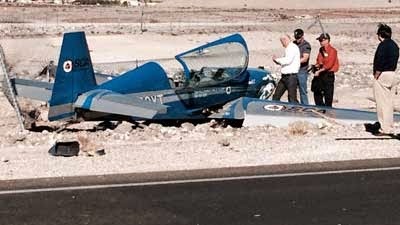 LAS VEGAS (FOX5) - A plane involved in a deadly crash Saturday evening originated from Henderson Executive Airport. The company, Vegas Extreme Adventures LLC, released a statement Sunday following the crash. According to the statement, an Extra EA-330LC plane registered to Vegas Extreme Adventures left from Henderson Executive Airport at about 4 p.m. Saturday. When the aircraft did not return on time, employees notified air traffic control of the missing plane, and immediately launched an aircraft for search and rescue operations. The crash site was located about 4:45 p.m., and Henderson Executive Airport was notified of the crash site near the Jean dry lake bed, the statement said. An instructor pilot, and student passenger were aboard the plane, and pronounced dead at the scene by emergency personnel, the statement said. The company did not release the identities of the deceased. The company said it was not aware of any distress calls prior to the crash. The statement said the company is working with the Federal Aviation Administration, and the National Transportation Safety Board to determine the cause of the crash. Vegas Extreme Adventures said it has been providing instructional aerobatic airplane rides to the general public since 2011. The company said it has conducted more than 15,000 incident-free flights during the past five years. A single-engine aircraft that crashed Saturday amid dark skies and rain, killing an instructor pilot and a passenger, belonged to a tourism fighter plane company that allows customers to operate planes with instructors’ assistance. Authorities were alerted about 5 p.m. Saturday that an Extra EA-330LC aircraft belonging to Sky Combat Ace had crashed minutes earlier about 4 miles east of Las Vegas Boulevard and a half-mile south of 8 Mile Mine Road, Henderson Executive Airport spokeswoman Linda Healey said Sunday. Earlier reports had suggested the crash occurred farther south. The plane had taken off about 4 p.m., said Megan Fazio of Sky Combat Ace's parent company, Vegas Extreme Adventures. The company sent out a search plane, then learned just after 4:45 p.m. that the missing plane had crashed near a Jean dry lake bed, Fazio said. Both people killed in the crash were men, she said; the Clark County Coroner’s office will identify them. No distress calls were received from the plane, Fazio said. About the same time the plane took off, thunderstorms moving southwest from Boulder City were blanketing the area of the crash, National Weather Service meteorologist Caleb Steele said Sunday. The plane “almost certainly” would have been flying in stormy weather if it was anywhere near the area of the crash, he said. 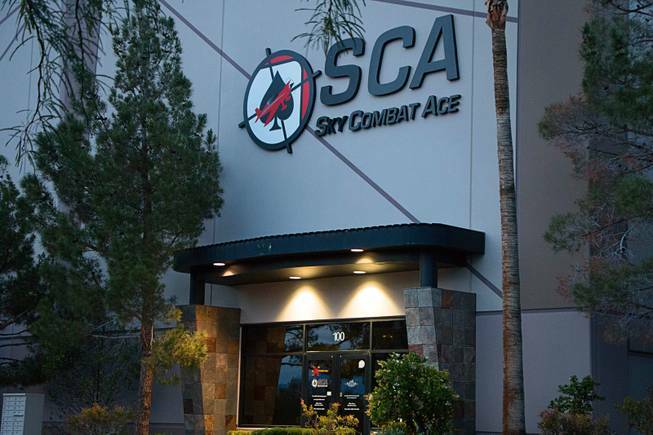 Sky Combat Ace, which operates out of Henderson as well as Gillespie Field near San Diego, bills itself as offering a “whole new level of adrenaline” on its website and touts a “perfect safety record,” with no injuries reported since its opening in 2011. It also states that it operates “7 days a week, 365 days a year." The company compares the passenger experience to that of “a steely-eyed fighter pilot at the controls of your very own fighter jet, pulling Gs and squeezing the trigger.” It says its planes are equipped with dual flight controls, allowing an instructor pilot to take over in the “unlikely event that it becomes necessary." Metro Police and the Clark County Fire Department did not respond to questions about whether a passenger or a pilot was in control at the time of the crash. 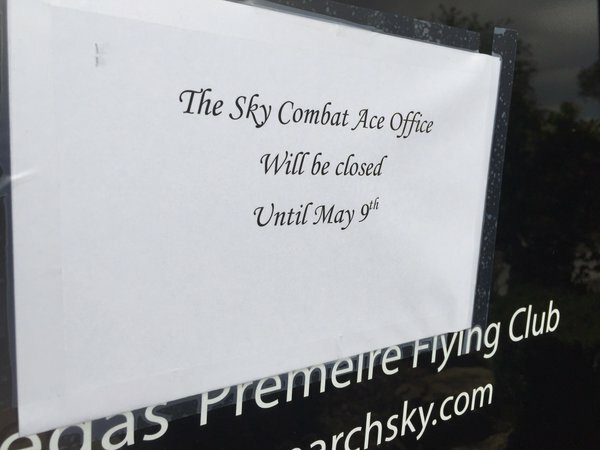 A sign at Sky Combat Ace's Henderson office said the business will be closed until May 9. The National Transportation Safety Board is taking over the investigation, Healey said. 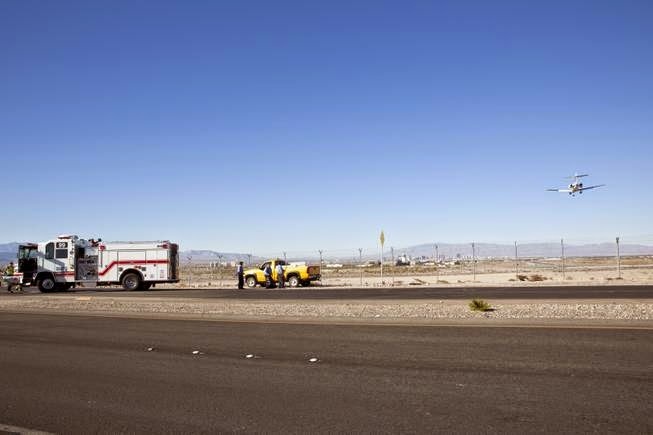 LAS VEGAS (KSNV News3LV) — Two people were killed Saturday afternoon when an acrobatic aircraft crashed near the California state line. The plane was identified as an Extra EA-330LC. The tail number, N330MT, is registered to Vegas Extreme Adventures, LLC and the registration says it was usually flown out of Henderson Executive Airport. On behalf of all Vegas Extreme Adventures employees and staff, we would like to express our deepest condolences to the families who have lost loved ones and have been affected by this unfortunate accident. Vegas Extreme Adventures is working closely and cooperating with the FAA and the National Transportation Safety Board to determine the cause of the accident. 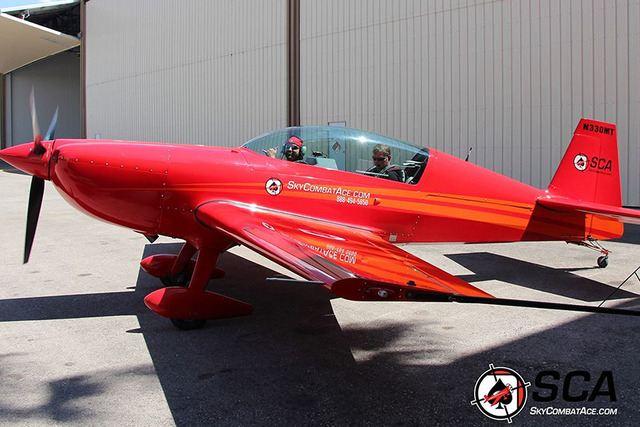 Vegas Extreme Adventures LLC has been providing instructional aerobatic airplane rides to the general public since 2011 and has conducted over 15,000 incident-free flights over the last 5 years. Metro said it received a call that a small single-engine plane went down in the area west of the dry lake beds near Jean, about 5 p.m.
Because of the weather and remote location, Metro Search and Rescue were responding for assistance and recovery, along with the Clark County Fire Department. CCFD Chief John Steinbeck says Engine 65 was first on the scene, but that it was difficult to find, about four miles east of Las Vegas Blvd near 8 Mile Rd. Chief Steinbeck says arriving responders found two people deceased at the scene, with one still in their seat and the other thrown 40 feet from the plane. McCarran Airport said the plane went down about nine miles south of Henderson Executive Airport and was reported to authorities by the pilot of another aircraft. The Clark County coroner's office will release the names of the two killed after relatives have been notified. Two people were killed Saturday when a single-engine plane crashed Saturday evening near the state line and Nipton Road, Las Vegas police said. Police and emergency crews responded to the area after receiving a call about a small single-engine plane that crashed about 5 p.m., Metro said. Arriving emergency crews located two deceased occupants, police said just after 6 p.m.
McCarran International Airport spokeswoman Linda Healy said the plane was a single-engine EXTRA EA300. The Clark County Fire Department responded to the scene, she said. According to its website, EXTRA is a manufacturer of aerobatic airplanes and variants of the EA300 are flown by demonstration teams for companies like Red Bull and Breitling. Details were not immediately available about where the plane was coming from or where it was headed, or if the weather played a role in the crash. The National Transportation Safety Board is investigating the crash, police said. A plane operated by a company that lets customers engage in mock dogfights made an emergency landing on a Henderson street today after possibly experiencing a mechanical problem, officials said. The Extra 330 LC plane was carrying two people when it landed on Volunteer Boulevard, stopping at the southern perimeter fence of Henderson Executive Airport, said Christine Crews, a spokeswoman for the Clark County Department of Aviation. Nobody was hurt, but the aircraft sustained major damage, Crews said. The plane, operated by Sky Combat Ace, took off from the airport at 11:15 a.m., according to a statement from the company. At about 11:40 a.m., air traffic controllers reported the pilot had declared an emergency and had to land. City of Henderson spokeswoman Kathleen Richards said the aircraft may have had a mechanical issue but the cause of the problem would be determined by the National Transportation Safety Board. On idle power, the plane was able to glide and descend for about two miles before landing about a quarter mile short of the airport runway, the company said. Henderson police and firefighters responded. There was one Sky Combat Ace employee and one passenger on board, the company statement said. Sky Combat Ace allows customers to engage in aerial dogfights and maneuver the aircraft once they reach 6,000 feet, company spokeswoman Megan Fazio said. Customers are not involved in takeoffs or landings, she said. Sky Combat Ace is working with the Federal Aviation Administration and the NTSB to determine the cause of the incident, the company said. In more than three years of operations and with in excess of 14,000 customer flights, Sky Combat Ace has not had an aircraft accident, the company said. Its pilots are trained for emergency landings, the statement said. 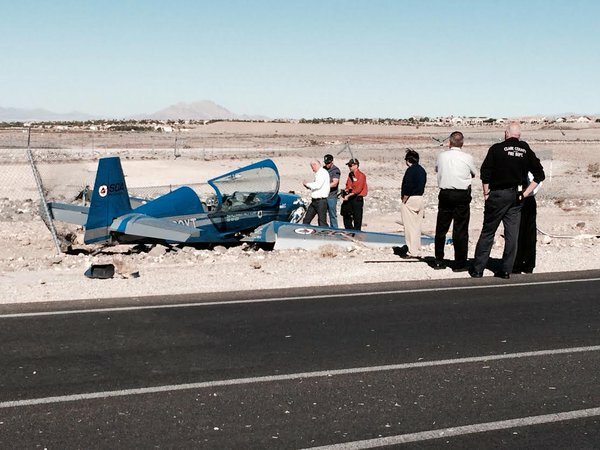 HENDERSON, NV (FOX5) - A small plane landed on a road near the Henderson Executive Airport on Wednesday morning. 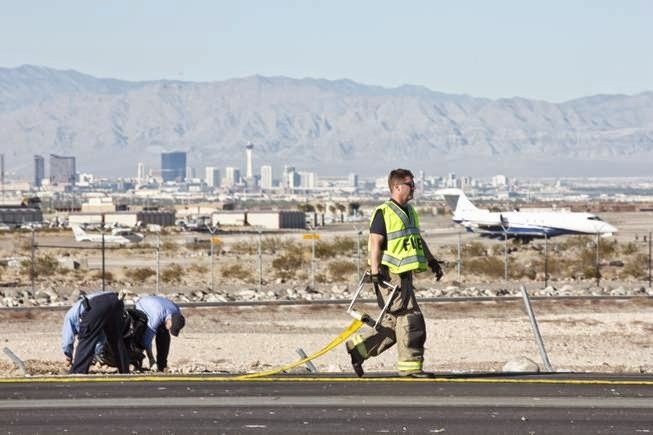 Christine Crews, of McCarran International Airport, said the Extra 330 private aircraft landed near the intersection of Volunteer Boulevard and Executive Airport Road around 11:50 a.m., about a quarter-mile short of the runway. Crews said the plane ended up crashing into the fence that surrounds the airport. She said the pilot did not contact the tower before the crash, but did after the landing to let authorities know about the situation. No injuries were reported, Crews said. A crane has been called in to remove the aircraft from the road, Crews said. Crews said the National Transportation Safety Board will conduct an investigation. 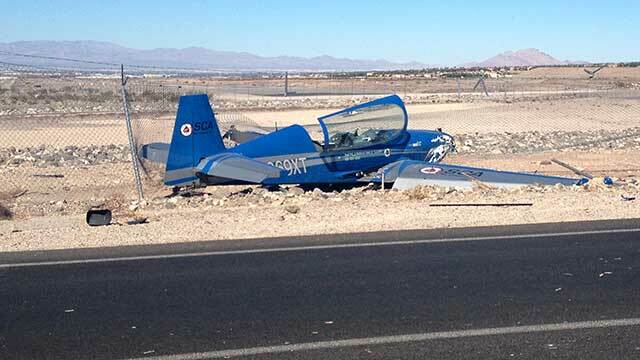 Henderson, NV (KTNV) -- A small plane landed just short of the airport on Wednesday. Around 11:46 a.m. an EXTRA 330 aircraft with 2 people on board made a hard landing in Henderson. The plane came down on Volunteer Boulevard and went into the fence surrounding Henderson Executive Airport, about one-fourth of a mile short of the runway. There were no injuries or fire, but the plane did have major damage. The pilot did not call into the control tower prior to the landing, so there are no details yet as to why the plane went down. Sky Combat Ace is working closely with the FAA and the National Transportation Safety Board and the investigation to determine the cause of the incident and will release the final cause upon completion of the investigation. The FAA, The National Transportation Safety Board, Fire, police, EMS and medical examiners were on call per airport protocol and responded immediately after Air Traffic Control gained knowledge of where the plane was going to land. The area is sealed off and restricted only to those personnel. Sky Combat Ace personnel are also at the site and are doing everything they can to be helpful to the investigation. Volunteer Boulevard is currently closed. 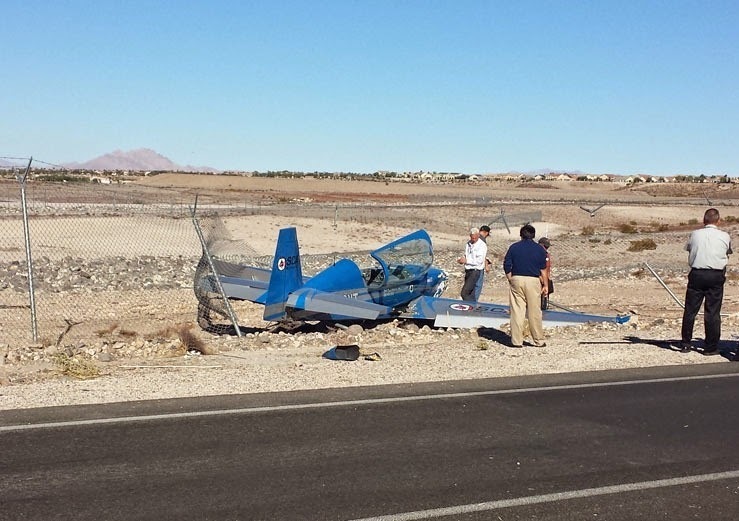 HENDERSON (KSNV MyNews3.com) – A small plane affiliated with Sky Combat Ace made an emergency landing Wednesday morning near Henderson Executive Airport. The Extra 330 with two people aboard was forced to land just after 11:45 a.m. about a quarter-mile south of Henderson Runway 3/5L on Volunteer Boulevard near Via Inspirada, said Christine Crews, spokesperson for the Clark County Aviation Department, which operates the airport. The pilot then steered the aircraft into the perimeter fence. Both people aboard were unharmed and left the aircraft on their own power. The plane sustained major damage, Crews said. According to the FAA, the plane is registered to “Unmanned Systems Inc.” based in Henderson. "Sky Combat Ace is working closely with the FAA and the National Transportation Safety Board and the investigation to determine the cause of the incident and will release the final cause upon completion of the investigation," according to a statement released for the company by Neon Public Relations. "The FAA, The National Transportation Safety Board, Fire, police, EMS and medical examiners were on call per airport protocol and responded immediately after Air Traffic Control gained knowledge of where the plane was going to land. The area is sealed off and restricted only to those personnel. Sky Combat Ace personnel are also at the site and are doing everything they can to be helpful to the investigation." The pilot did not contact the tower until after the plane landed, Crews said. Names of the pilot and passenger were not released. The Henderson Police and Fire departments responded to the accident. 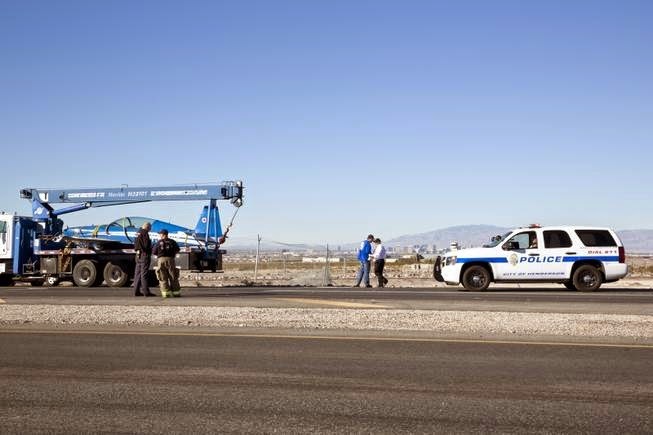 HENDERSON, Nev. — A small plane crashed into a fence Wednesday morning on the outskirts of the Henderson Executive Airport. Two people were onboard but were not hurt in the crash, officials said. 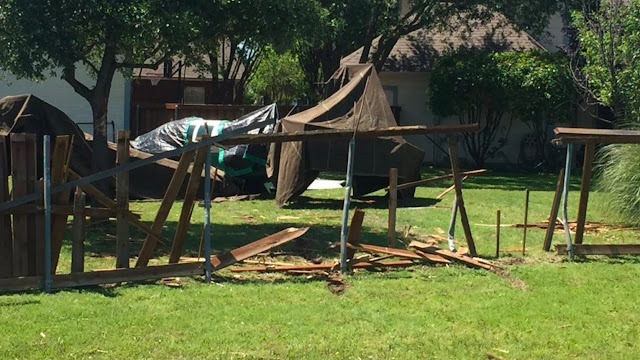 The two-seater struck a fence off Volunteer Boulevard just before noon. No cars were involved. The plane is owned by Sky Combat Ace, which operates out of the airport. In a news release, the company said it was working with the Federal Aviation Administration and National Transportation Safety Board in the crash investigation. The pilot worked for Sky Combat Ace, a release said. Other details surrounding the crash, including the cause, have not been released.